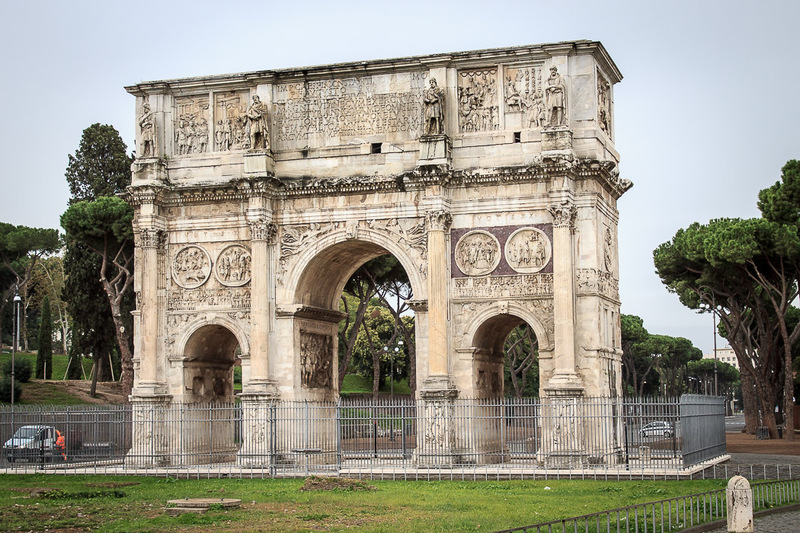 The Arch of Constantine is the best-preserved triumphal arch in Rome, and also the most recent of the three remaining triumphal arches in Rome, having been dedicated on July 25, 315 AD (the others being the Arch of Titus and the Arch of Septimius Severus). 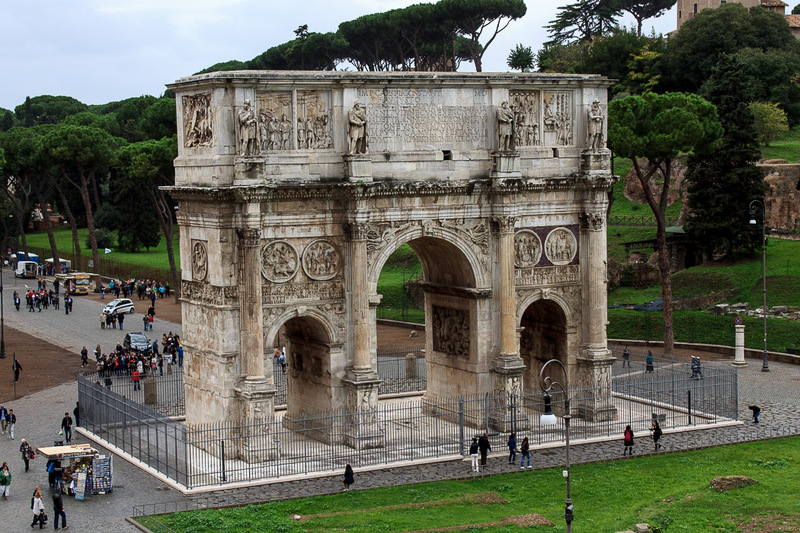 This last great relic of Imperial Rome is an imposing monument of grey and white Proconnesian marble, located right next to the Colosseum, standing 69 feet tall by 85 feet wide and 24 feet deep, with a central archway 38 feet tall by 21 feet wide, and the arches on either side 24 feet tall by 11 feet wide. 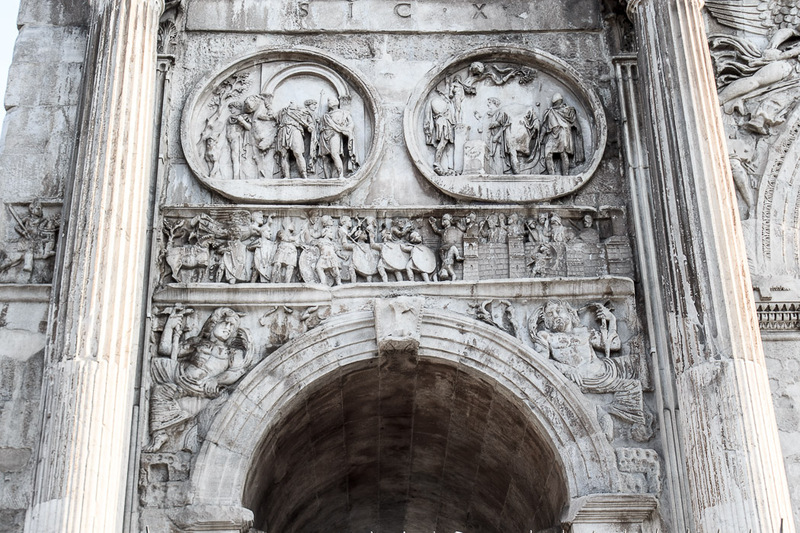 The arch is decorated by artwork which was taken from several other sources as well as artwork which was made specifically for this arch, providing a fascinating contrast on the quality and style of artwork at various periods. 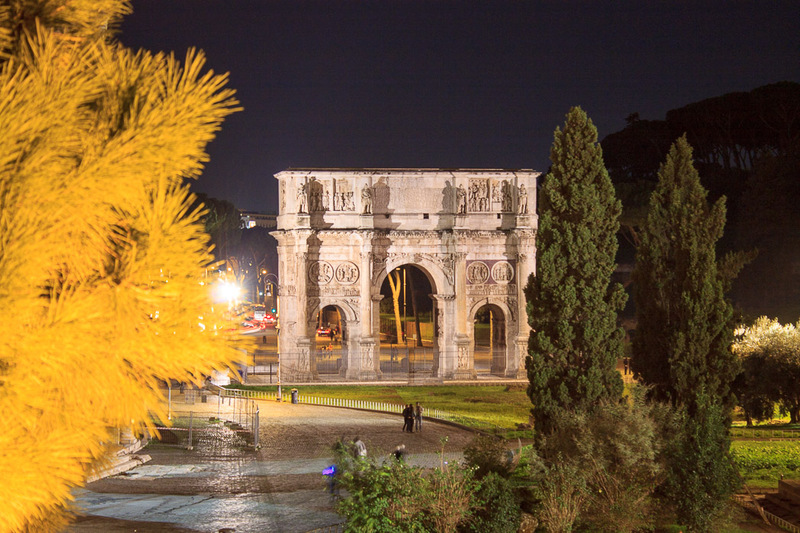 See all Arch of Constantine photos. 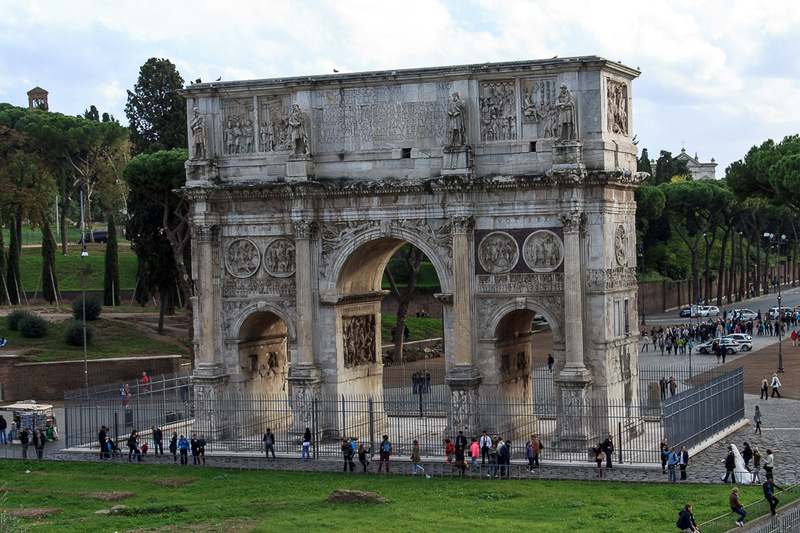 The arch was erected by the Roman Senate to commemorate emperor Constantine's victory over emperor Maxentius in the Battle of Milvian Bridge on October 28, 312. 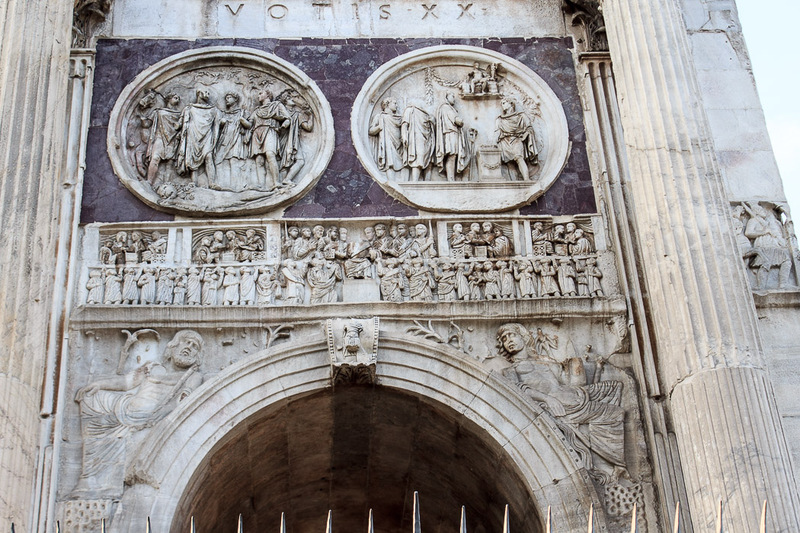 The Senate dedicated the arch in 315 AD, during the celebration of Constantine's 10th year as emperor (his Decennalia). 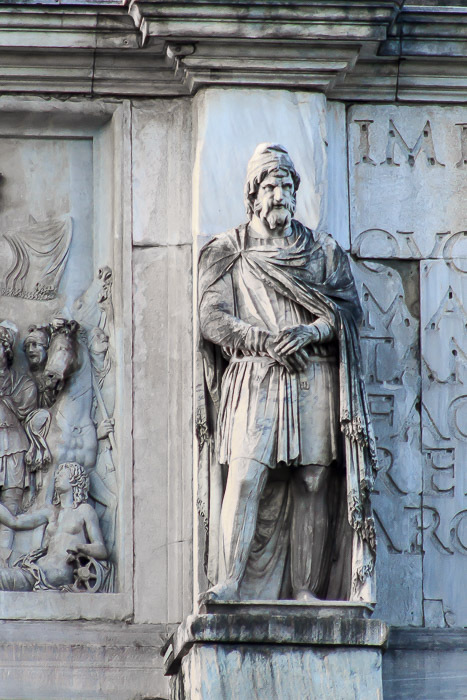 The Battle of the Milvian Bridge started Constantine on the path which ended the Tetrarchy (leadership of the Empire by four emperors, started by Diocletian) and resulted in him becoming sole ruler of the Roman Empire in 325 AD. This battle also marked the beginning of Constantine's conversion to Christianity, as Constantine had a vision of the Christian God promising victory ("By this sign, conquer") if he put the Christian sign of the Chi-Rho on his army's shields. Facing an army much larger than his own, Constantine was happy to try anything to achieve victory, and had his soldiers carry the Christian symbol into battle. 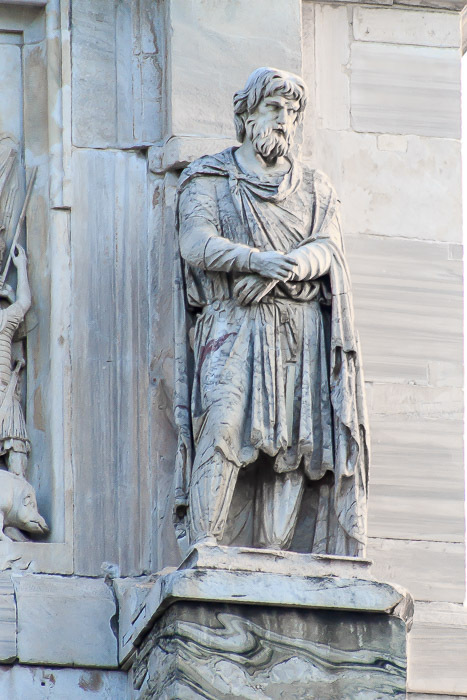 Constantine's forces won the battle, and Constantine adopted Christianity for himself and declared the religion officially tolerated throughout the Roman Empire via the Edict of Milan in 313 AD, ending Christian persecution. 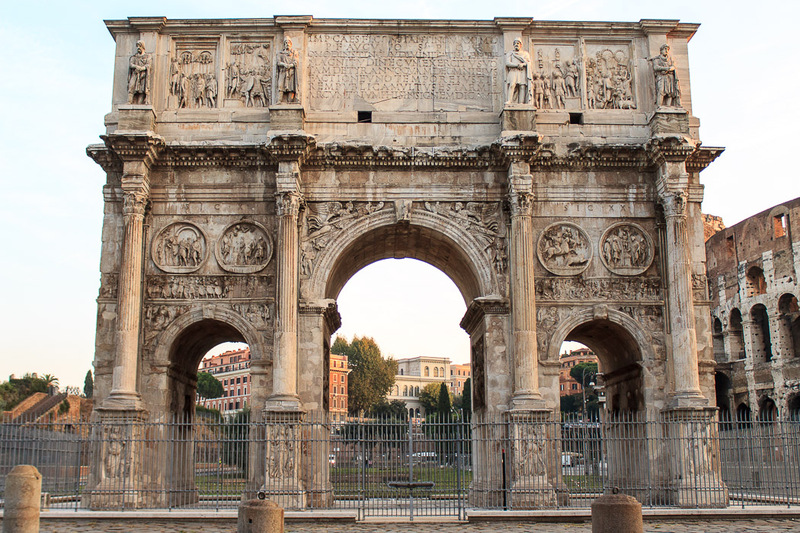 Thus, the event celebrated by the Arch of Constantine was a major turning point in the history of the western world. 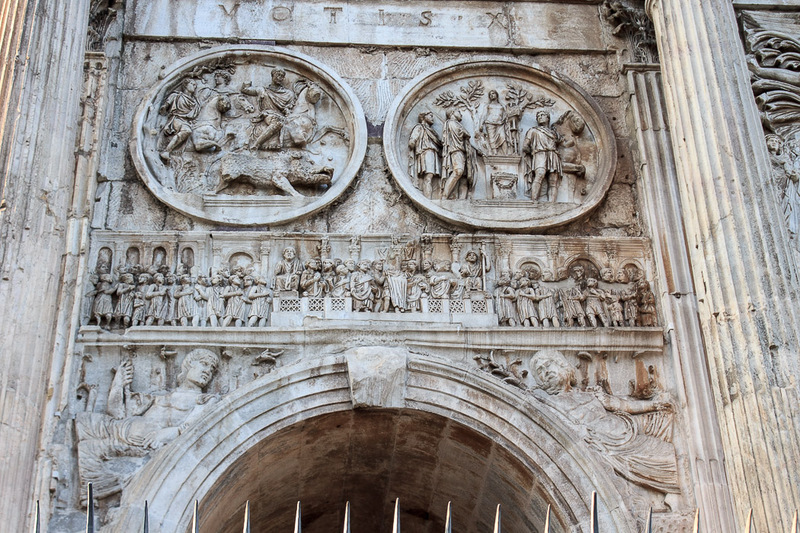 Of course, a lot of this story might be embellishment after-the-fact, especially since there are no Christian symbols on the arch, and no Chi-Rho symbols painted onto the shields of the Roman soldiers in the friezes showing the battle. This might also be because the Senate, who funded the arch, might have wanted to downplay the Christian leanings of Constantine. 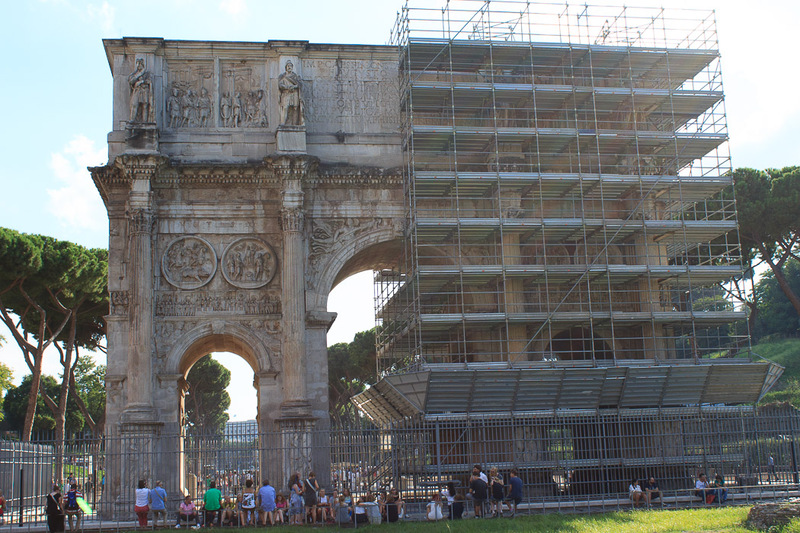 During autumn of 2013, the western half of the Arch of Constantine was covered by scaffolding (photo below) on both the north and south sides. That makes at least 7 things that are undergoing renovation in fall of 2013, the other six being the Colosseum, the Pyramid of Cestius, the Fountain of Ponte Sisto, the Triton Fountain, the Bernini Fountain and the Fountain at Villa Medici. 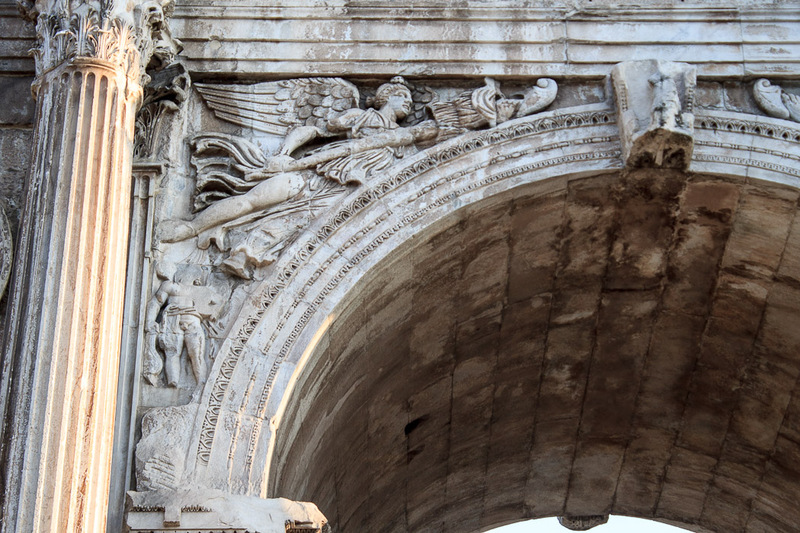 During a subsequent trip during autumn of 2014, the renovation of the Arch of Constantine was complete, and most of the detailed photos on this page were taken during that trip. 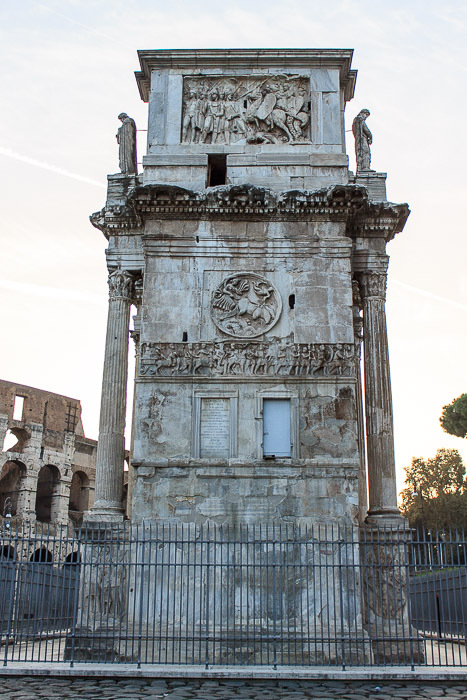 The northern face of the Arch of Constantine (the side facing the Colosseum) is shown in the 1st photo below, and the southern face is in the 2nd photo below. 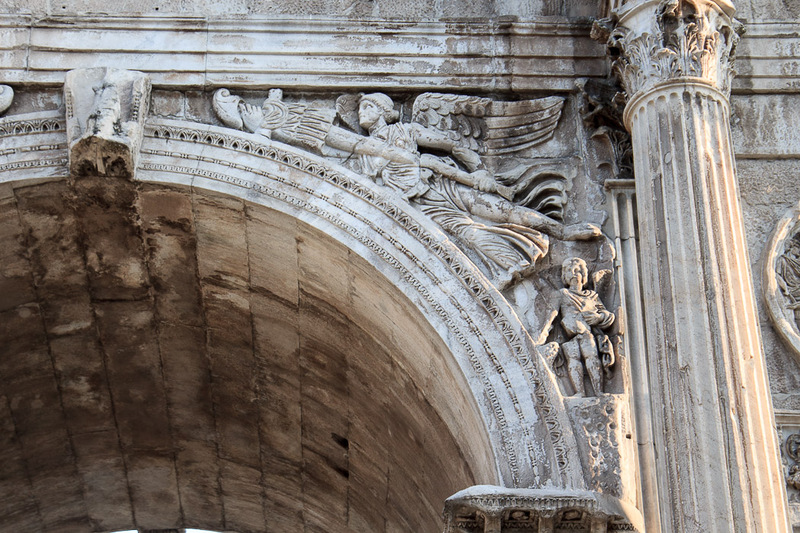 There is a large central arch which a triumphal parade would pass through, and the two smaller side arches. Four columns with Corinthian capitals surround the side arches on each face of the arch. 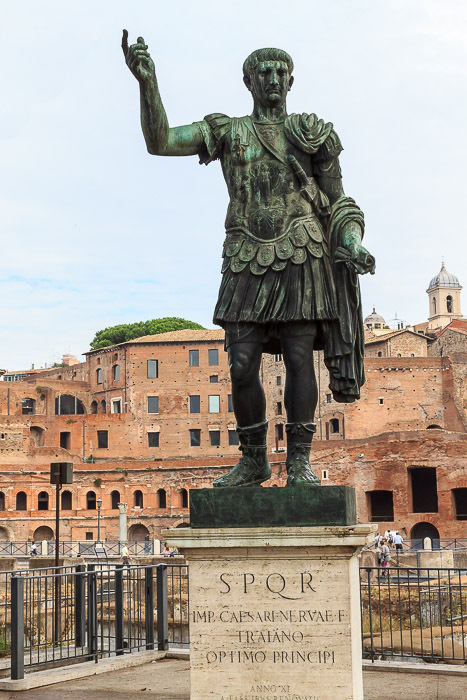 Those columns are made of Numidian yellow marble, and each stands on a pedestal (called a socle) with friezes on three sides, and each is topped by a statue of a captured Dacian solder which was taken from Trajan's Forum. 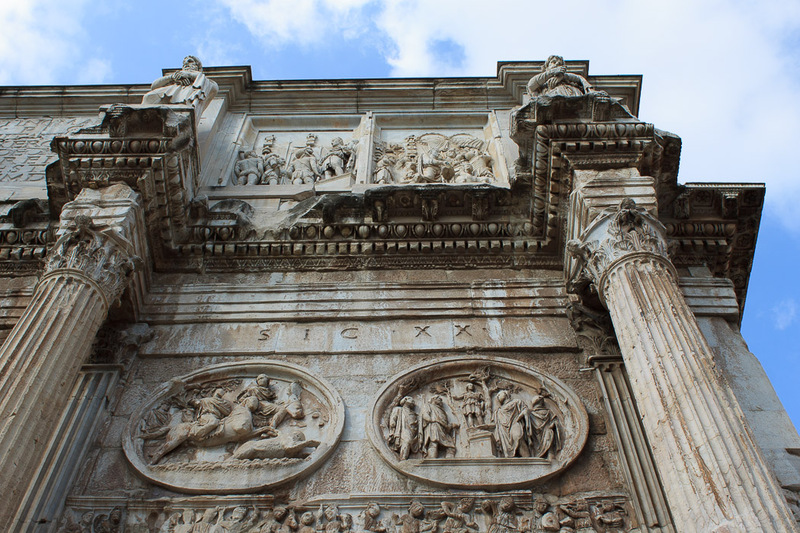 The four columns on each side are detached from the main body of the Arch of Constantine, standing about a foot away from the structure. They perform no structural function on the arch, playing no part in supporting anything. The socles and the stones upon which the Dacian soldiers stand are attached to the main body. The right-most yellow column on the northern side of the Arch was removed and relocated to the inside of the north door of the church of San Giovanni in Laterano to support the organ loft, then replaced with a white marble column here on the Arch. Behind each column a pilaster (a flat square column that is carved into a wall) is carved into the face of the monument itself, as can be seen in the 3rd photo below. The eastern and western sides of the arch are shown in the 4th and 5th photos below. The top layer of the Arch is called the 'attic'. 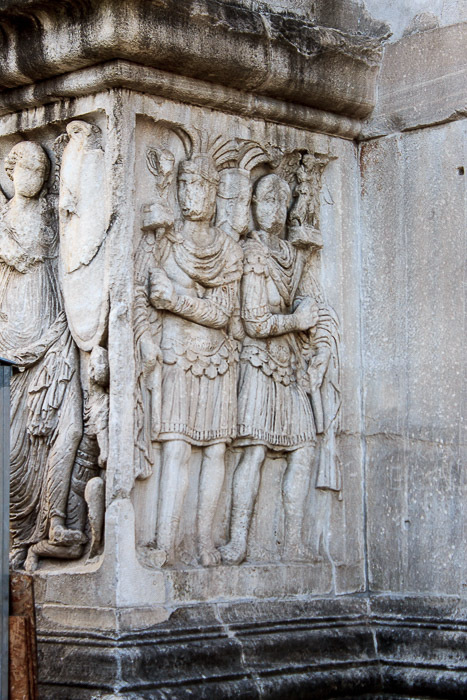 Four Dacian soldiers appear on each side of the arch in front of the attic, on top of the four columns, carved from pavonazzetto marble, taken from Trajan's Forum. 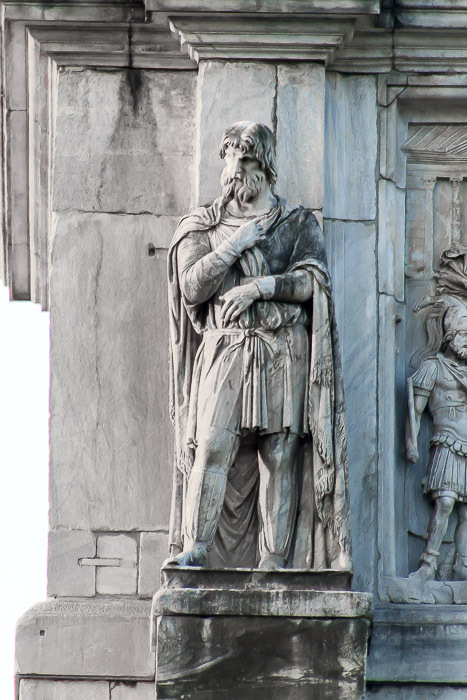 Dacia, modern day Romania, was conquered and added to the Roman Empire by Emperor Trajan through a series of two wars from 101 to 102 AD and 105 to 106 AD, which are well documented on Trajan's Column; see that page for information about Dacians. The 1st and 3rd photos below show the four Dacian soldiers on the northern face. 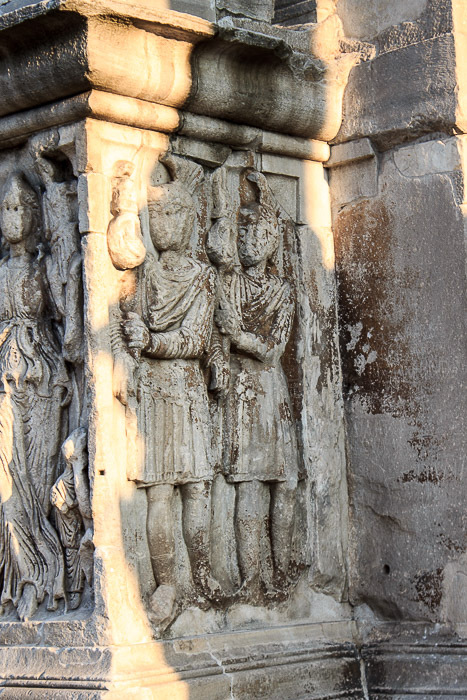 The 4th and 6th photos below show the four Dacian soldiers on the southern face. One of the Dacian soldiers (the 3rd on the southern face, left Dacian in 6th photo below) is a modern (1731-2) replica. The other seven have restored hands and feet. Close-ups of the 8 Dacian soldiers are shown below. The first four are from the northern face, in order left to right, and the second four are from the southern face, again in order left to right. 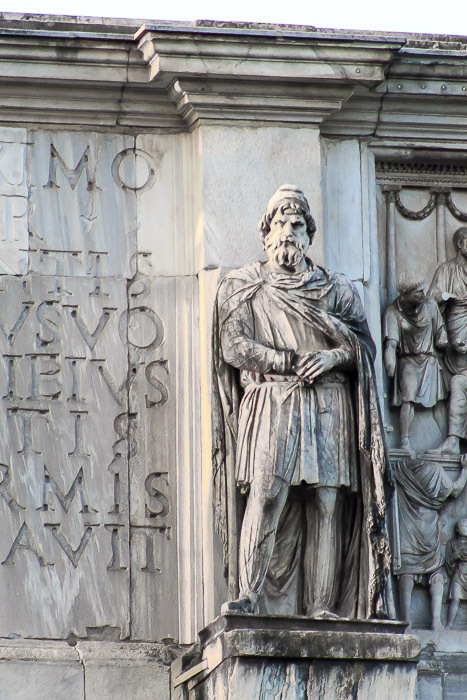 The reliefs between the Dacian soldier statues were created between 176 and 180 AD for an arch erected by Commodus to honor his father, Marcus Aurelius' victories in the German wars and subsequently confiscated for reuse on this monument. 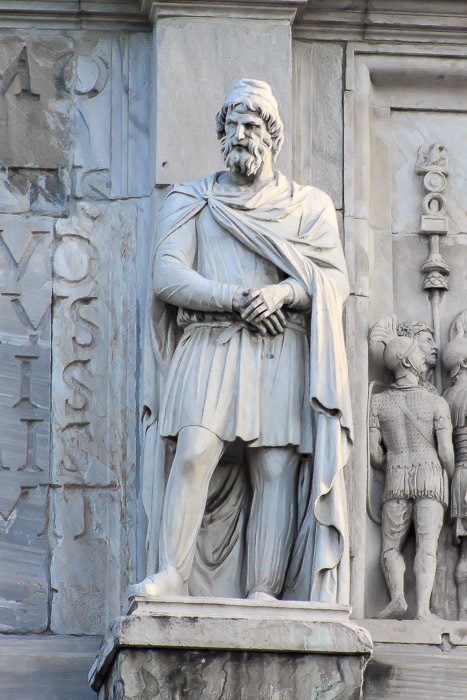 They portray Marcus Aurelius as a benevolent ruler, conducting his civic duties. 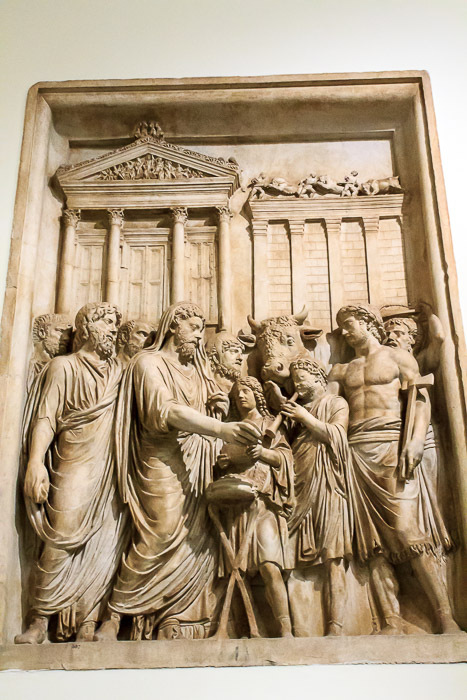 Together with three panels now in the Capitoline Museum, the reliefs were probably taken from a triumphal monument commemorating Marcus Aurelius' war against the Marcomanni and the Sarmatians from 169 - 175, which ended with his triumphant return to Rome in 176. These frames give the viewer a sense of the bravery and leadership of the emperor as well as help the viewer understand the importance of the imperial system and generosity of its ruler to the empire's well-being. 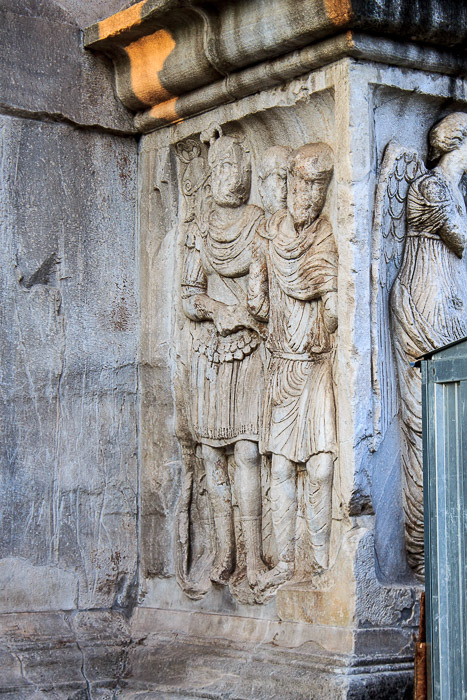 At the time they were reused on this monument, the head of Marcus Aurelius in each of the panels was recarved to be the head of Constantine. It would be a relatively simple matter to remove Marcus Aurelius' beard to reflect Constantine's clean-shaven chin; I don't know how one would change the other features on the face without reducing the depth of the relief, but then, (dammit Jim,) I'm no ancient Roman professional sculptor. Tougher still, the face was again changed during the 18th century to the likeness of Trajan, so his is the face we see today in the Marcus Aurelius reliefs on the Arch of Constantine. 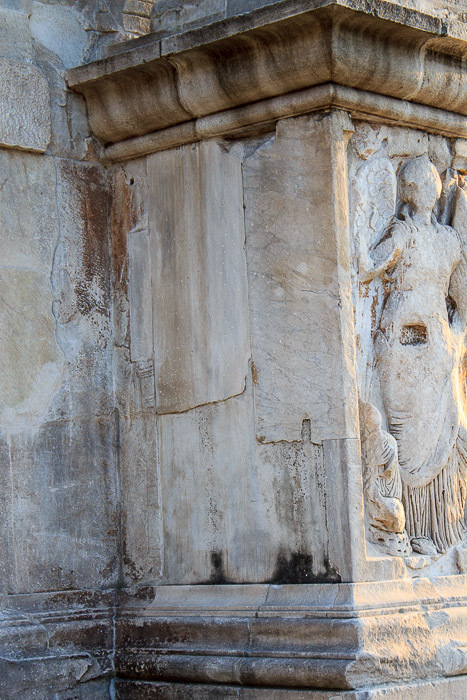 Some scholars find evidence that these reliefs actually came from two monuments, the second being one dedicated to Lucius Verus and located on the Appian Way, but the fact that the 8 panels are all of identical size makes this unlikely. 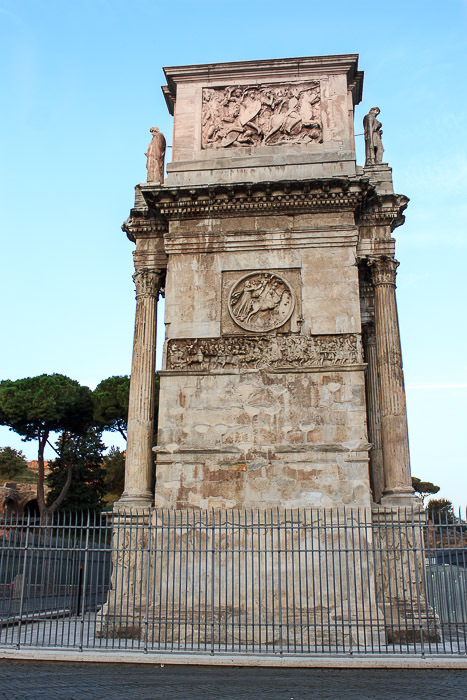 The three other panels from the arch of Marcus Aurelius in the Capitoline Museum are also of the same size. 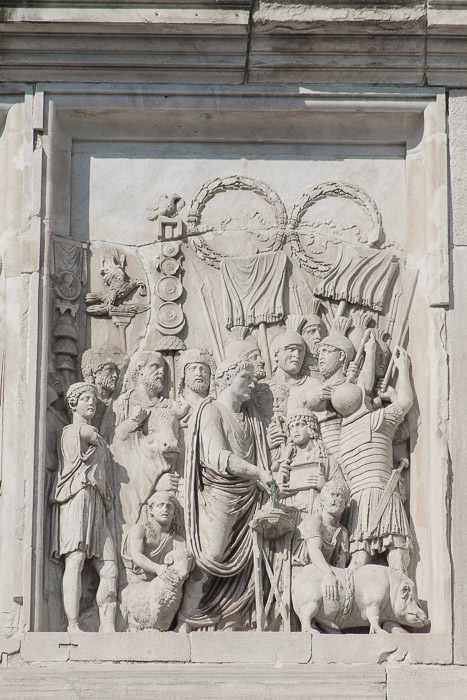 The first panel on the northern face (1st photo below) is called the adventus panel, and portrays the emperor's return to Rome after a victorious campaign against the Germans and Sarmatians in 176 AD. Marcus Aurelius is the central person. Standing behind him at the left edge is the Roman god of war, Mars, dressed in his typical garb of armor, helmet, and bulging bicep. Mars was equivalent to the Greek god of war, Ares. The Campus Martius in Rome, near the place where the Pantheon still stands today, was the training ground for Roman soldiers and athletes, and gets its name from Mars. In front of Marcus Aurelius at the right edge is Roma, the helmeted female god who represented the city of Rome as well as the entire Roman Empire. 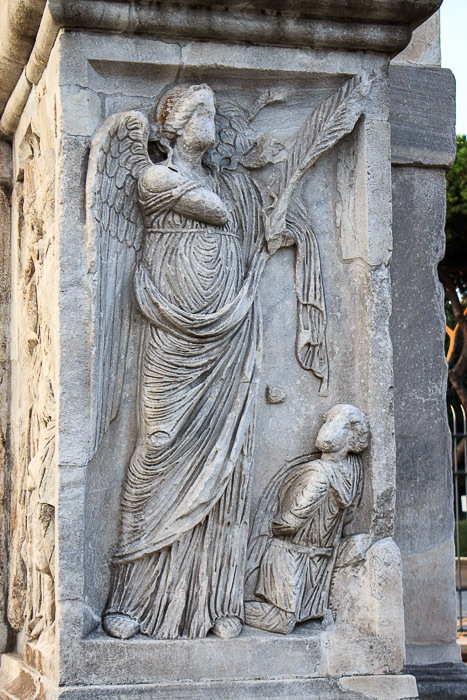 Above Marcus Aurelius is Nike, a representation of Victory, and she flies in front of the Temple of Fortuna Redux, which was located on the Via Latia in the Campus Martius. 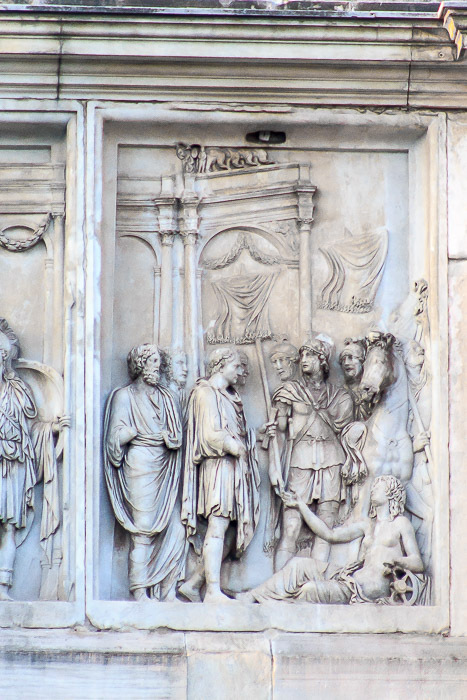 The second panel on the northern face (2nd photo below) is called the profectio panel, and shows Marcus Aurelius' departure for that northern campaign in 169 AD. The profectio is a convention in Roman Imperial art showing the figure of an emperor or military general setting out for battle. The emperor is the second foreground character from the left, dressed in a short tunic, and walking toward the right. The reclining woman he walks toward is a personification of the Via Flaminia (the major road leading north out of Rome), who bids him farewell. 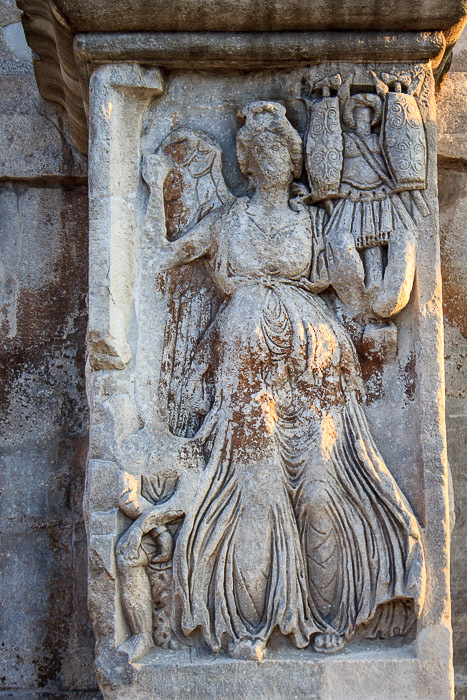 Standing in front of Marcus Aurelius is the goddess Virtus (Virtue), similar in appearance to Roma, but dressed for travel; she will presumably accompany the emperor into battle to endow him with valor, manliness, and courage. The bearded man on the left is the genius senatus, a representation of the concept of the Roman Senate and its role in government. 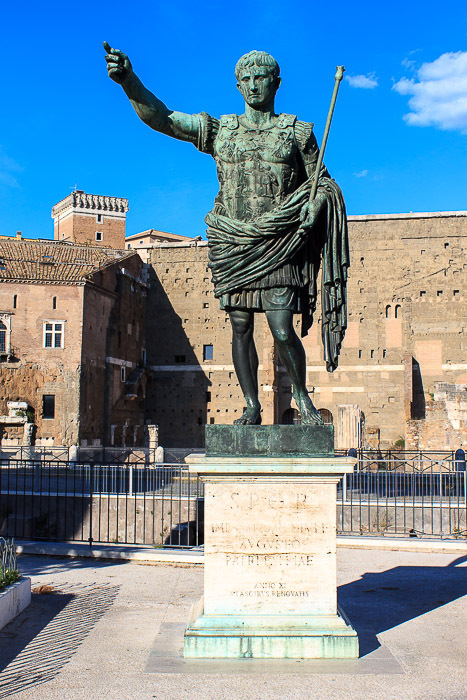 According to SPQR, the emperor receives his power from the senate and the people of Rome. The structure in the background is the Arch of Domitian in the Campus Martius, which displays a chariot drawn by elephants on its top. 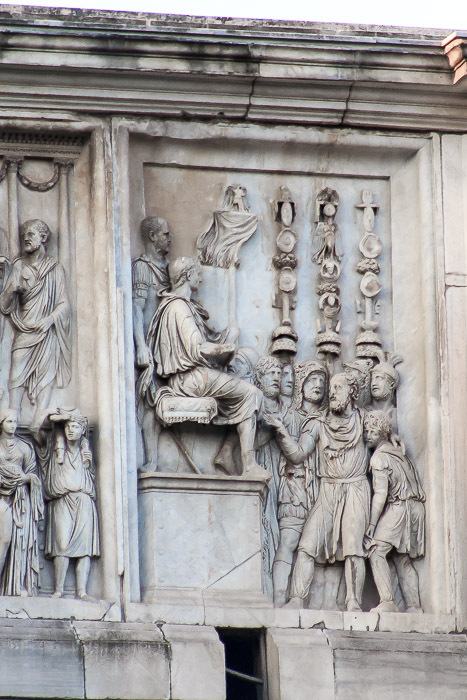 The third panel on the northern face (3rd photo below) shows the liberalitas of 177 AD, and shows Marcus Aurelius, seated at the center on top of the podium, distributing money to the people. 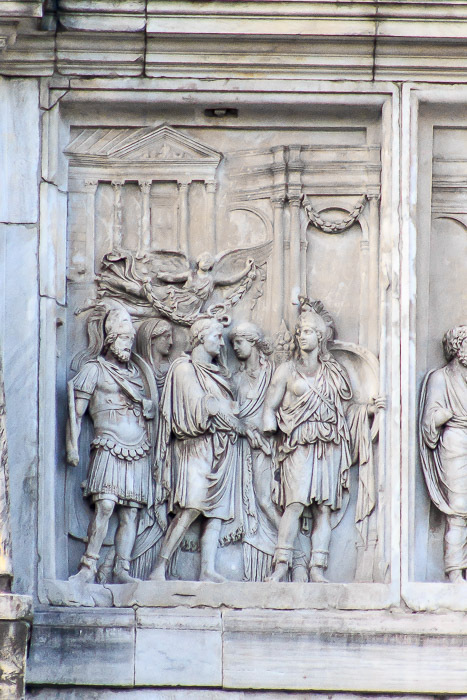 Commodus, Marcus Aurelius's son, once appeared on this panel in the odd-looking void to the right of Marcus Aurelius, since they both took part in this ceremony after their joint victory of 176 AD. But after Commodus went crazy and became extremely unpopular and was assassinated, his memory was damned (damnatio memoriae) by the senate, causing him to be removed from all inscriptions, statues, friezes, etc, as if by doing this they could make him never exist. 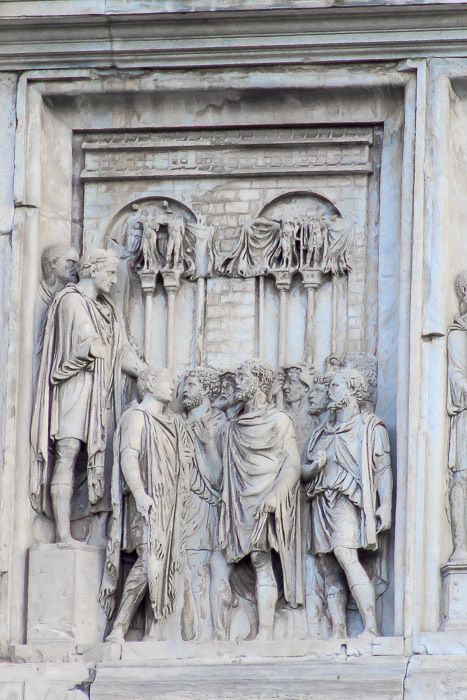 The fourth panel on the northern face (4th photo below) is called the clementia panel, and shows the emperor interrogating a German prisoner. The emperor is seated on a stool, with his right-hand man Pompeianus standing beside him. Roman soldiers with flags and standards surround the two prisoners, an older man and a young boy holding him up. This panel also shows evidence of Commodus' damnatio memoriae. There are two faces on the center one of the three standards, one on top of the other, the top one being near the center of the standard vertically. That top face is in good shape, and probably portrayed Marcus Aurelius. The lower one probably portrayed Commodus, and was scratched out. 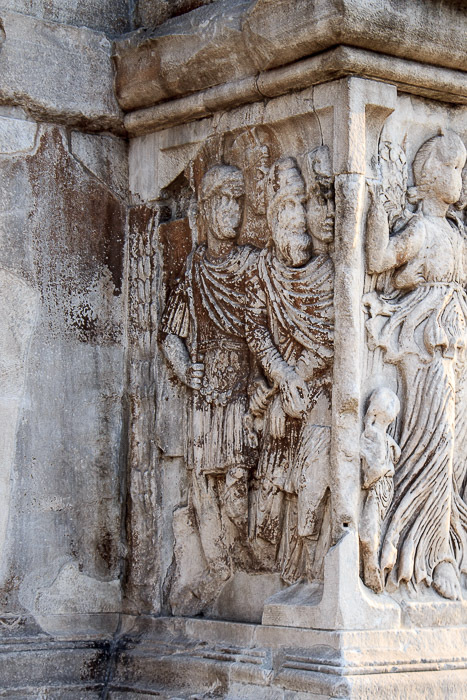 The first panel on the southern face (1st photo below) is called the Rex Datus panel, in which a the emperor, standing on a podium, extends his left hand to either crown or introduce a vassal king to the Roman soldiers. A peace treaty has apparently been signed and a former enemy is now an ally. 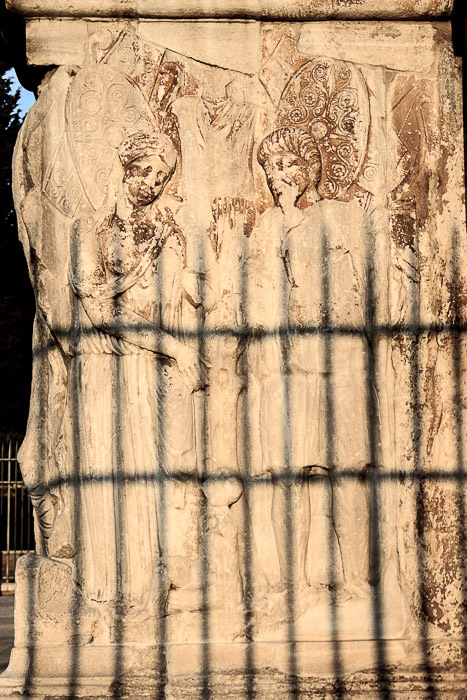 The second panel on the southern face (2nd photo below) shows prisoners brought before the emperor, standing on a podium, in the field, as indicated by the tree on the right side of the panel. The captive being touched by Marcus Aurelius appears to have submitted and accepted his fate, but the one in the background behind him is still resisting and being held away from the emperor by a soldier. 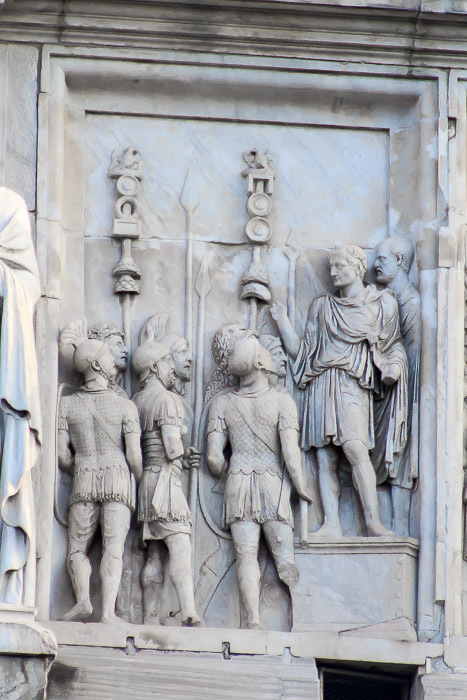 The third panel on the southern face (3rd photo below) is called the adlocutio panel shows the emperor speaking to his troops before battle to motivate them. The emperor might have held a lance in his left hand, is gesturing with his right hand, and the seven troops shown pay total attention to their leader. The top part of the panel is a restoration. The adlocutio is one of the most widely represented formulas of Roman art. Characteristic of the formula is the outstretched hand of speech and the contrapposto pose with the weight clearly shifted to one leg. 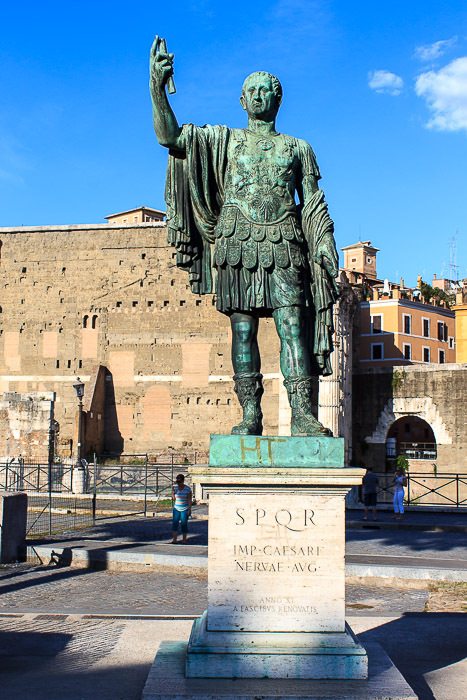 Compare this to the Augustus of Prima Porta, or the statues of Augustus, Nerva, or Trajan on Via dei Fori Imperiali. The fourth panel on the southern face (4th photo below) is called the lustratio panel, showing the emperor with his army before a battle, sacrificing a pig, sheep and bull in a religious rite called the suovetaurilia (also depicted on the back side of the Plutei of Trajan) in which Mars would be expected to purify the land. 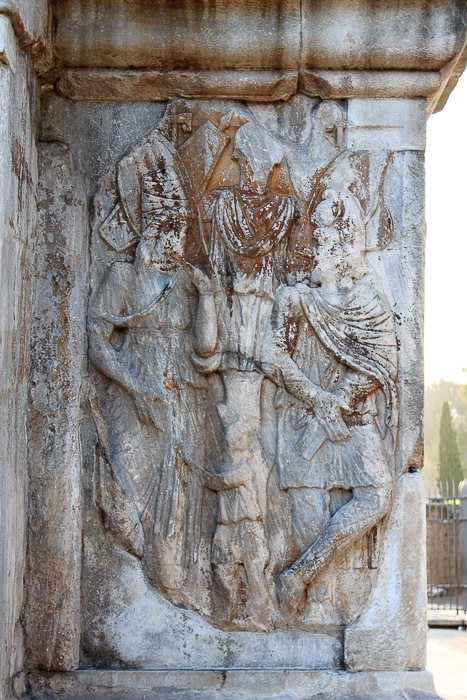 Soldiers stand behind a musician and an incense-bearer (camillus). 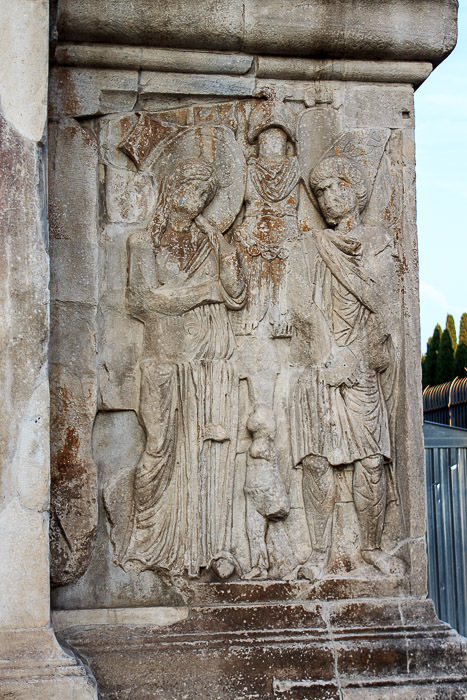 This panel is evidence that Constantine had not yet converted to Christianity, since this a pagan ritual, or maybe it was selected for the arch by the Senate, who had optimism that Constantine would continue pagan traditions. The three panels now located in the Capitoline Museum, in which Marcus Aurelius' face has not been modified, are described below. 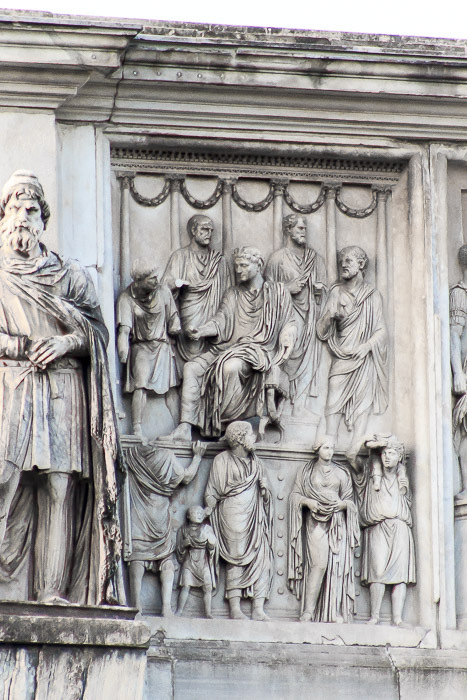 The 'sacrifice' relief (1st photo below) shows Marcus Aurelius in his role as pontifex maximus or chief priest, one of the traditional roles of a Roman Emperor. 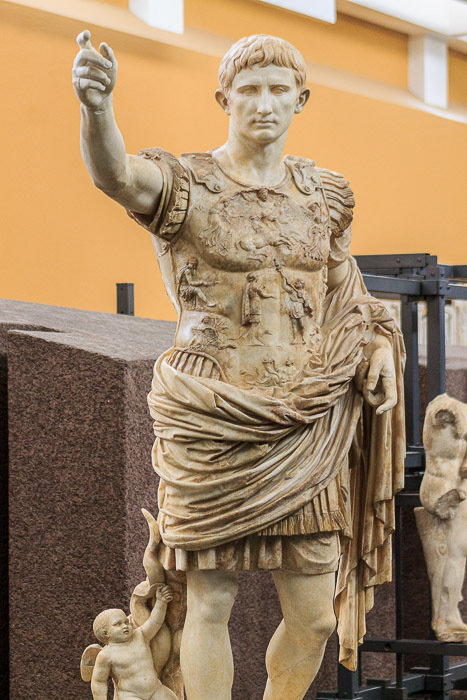 Augustus is sculpted in this role in the Palazzo Massimo. Typically, sculptures of emperors in this role are wearing a toga with a hood covering their head, and are holding a patera, a dish used during sacrifice. Considering how important religion and tradition was to Roman people, it was important for the emperor to demonstrate his conviction to these ideals. 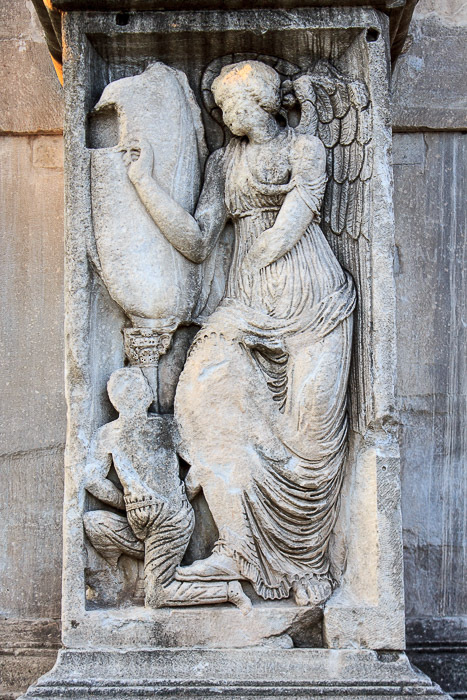 The temple in the background of this relief might be the Jupiter Optimus Maximus Capitolinus located on top of the Capitoline Hill. 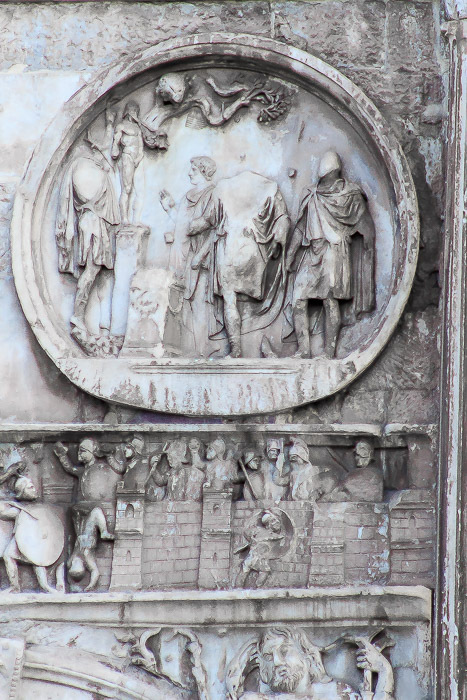 The 'conquest and clemency' relief (2nd photo below) shows Marcus Aurelius dressed in a cuirass, on horseback. The trees in the background suggest he is in reviewing the battlefield after a victory. Barbarians surrender at his feet and beg for mercy. 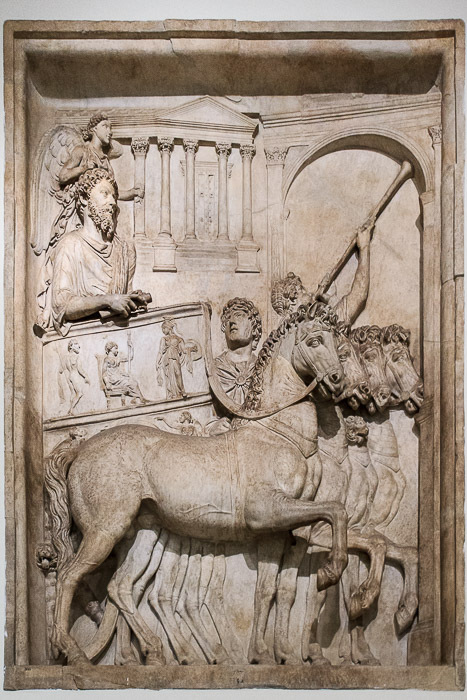 Marcus Aurelius' pose in this relief is reminiscent of the emperor's equestrian statue in the Capitoline Museum. 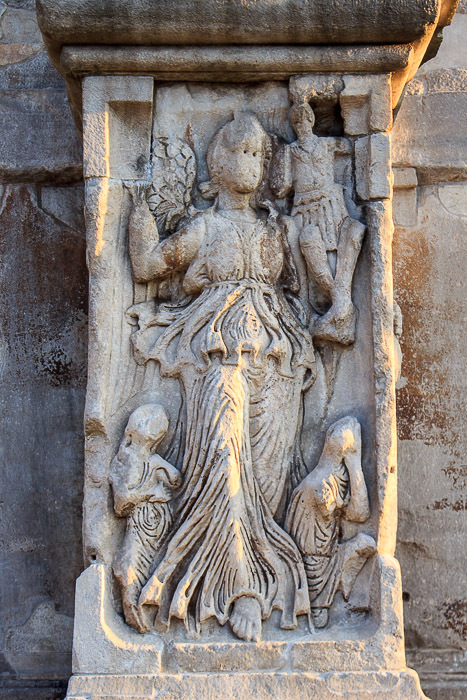 The 'Triumph' relief (3rd photo below) shows Marcus Aurelius riding a four-horse chariot and being crowned by Nike, a representation of Victory. 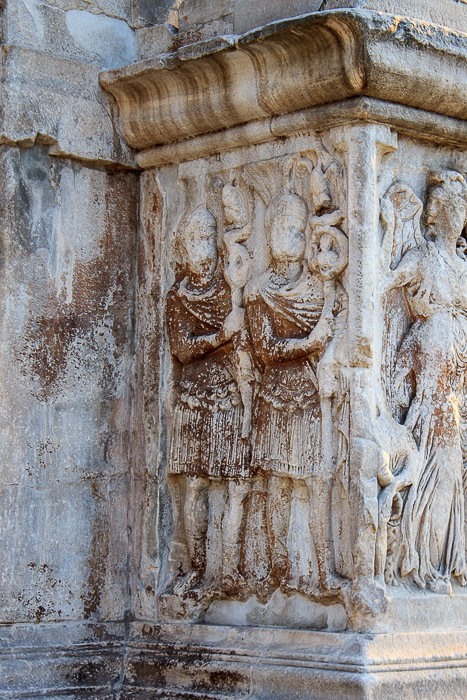 The chariot is decorated with reliefs showing the figures of Neptune and Minerva flanking the figure of Roma. A temple is shown in the background, and a triumphal arch is shown on the right, presumably the arch that the emperor's chariot has just passed through as his triumphal procession has just begun. Commodus was probably also in the chariot originally, as suggested by the large size of the chariot and the figure of Nike who was probably centered above the two characters and holding crowns for them both. 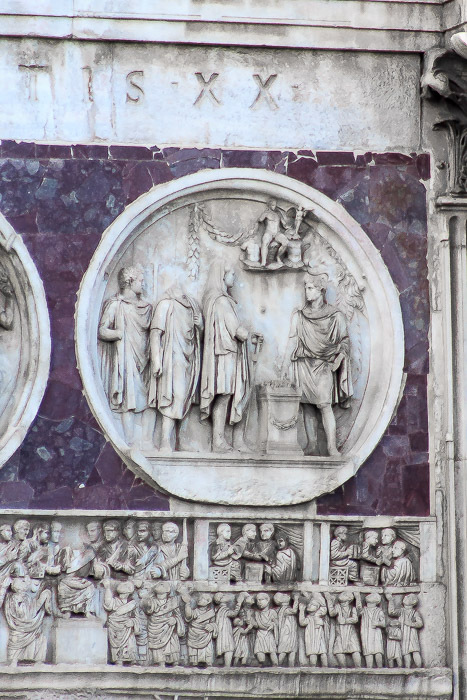 After Commodus went crazy and became extremely unpopular and was assassinated, his memory was damned (damnatio memoriae) by the senate, causing him to be removed from all inscriptions, statues, friezes, etc, as if by doing this they could make him never exist. 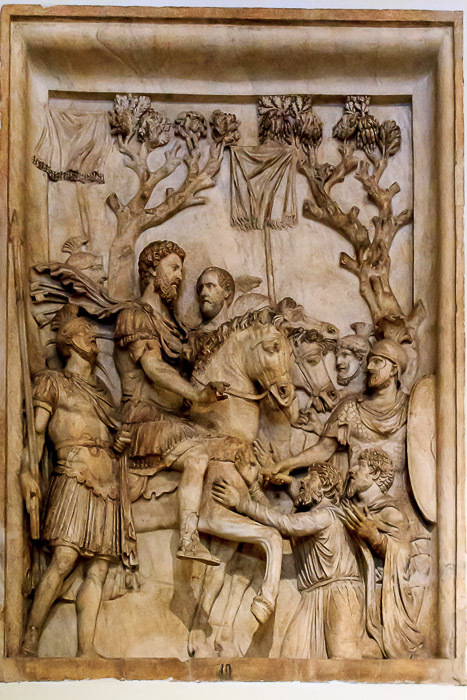 Relief showing Triumph of Marcus Aurelius, from the arch dedicated to Marcus Aurelius, now on the first landing of the main staircase of the Capitoline Museum. The emperor shows mercy to the defeated, striking a pose similar to that of his equestrian statue at the center of the Campidoglio. 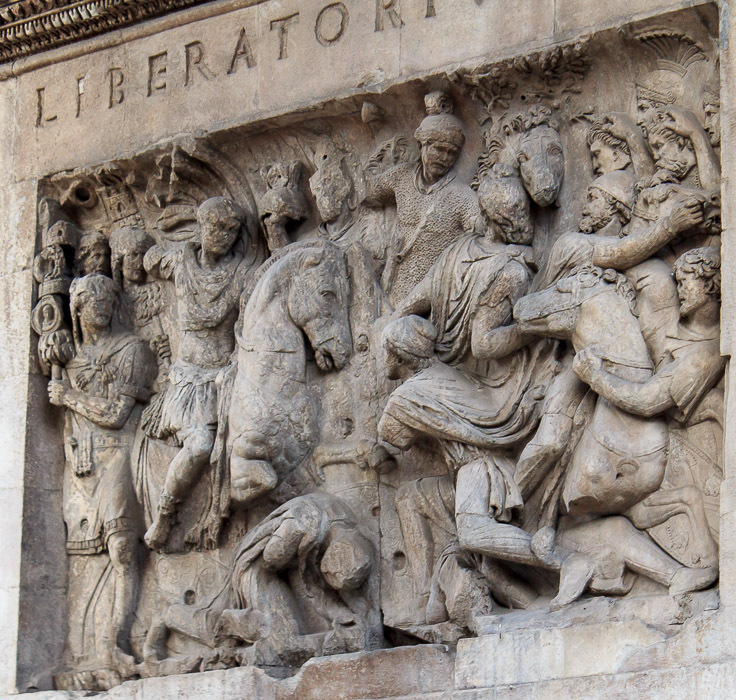 Relief showing the Triumph of Marcus Aurelius, from the arch dedicated to Marcus Aurelius, now on the first landing of the main staircase of the Capitoline Museum. Commodus was probably chiseled out of this relief after his death in disgrace, as evidenced by the fact that the chariot is oversized for one person, and the figure of Victory holds two crowns. In the center of the attic is the inscription for the Arch, identical on both sides (north face in 1st photo below, south face in 2nd photo below), which would originally have been in bronze letters which have since been stolen. 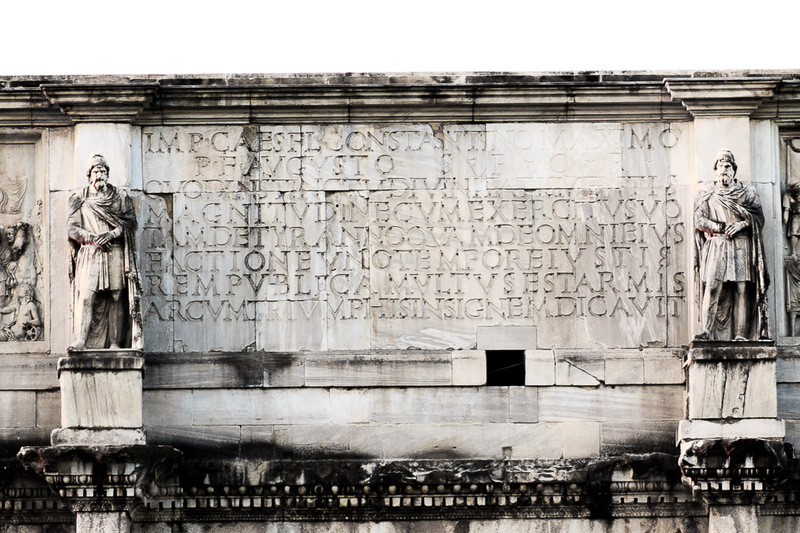 Luckily, the recesses in which the letters sat remain along with their attachment holes, allowing the inscription to be easily read and translated as: "To the Emperor Caesar Flavius Constantinus, the greatest, pious, and blessed Augustus: because he, inspired by the divine, and by the greatness of his mind, has delivered the state from the tyrant and all of his followers at the same time, with his army and just force of arms, the Senate and People of Rome have dedicated this arch, decorated with triumphs". 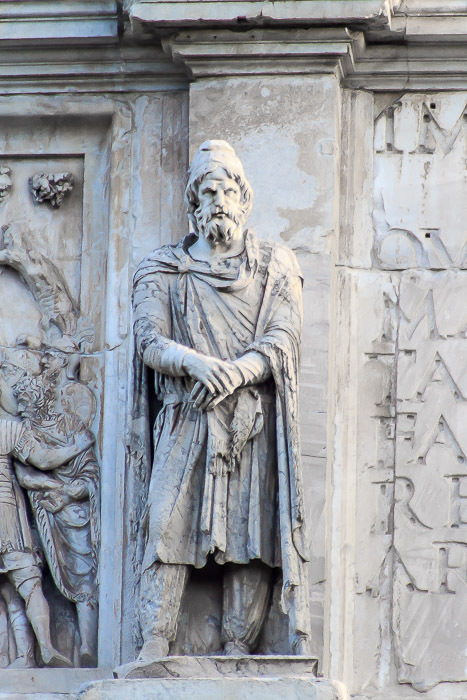 The tyrant was, of course, Maxentius, who Constantine defeated on the Milvian Bridge to take sole control of the western half of the Roman Empire. 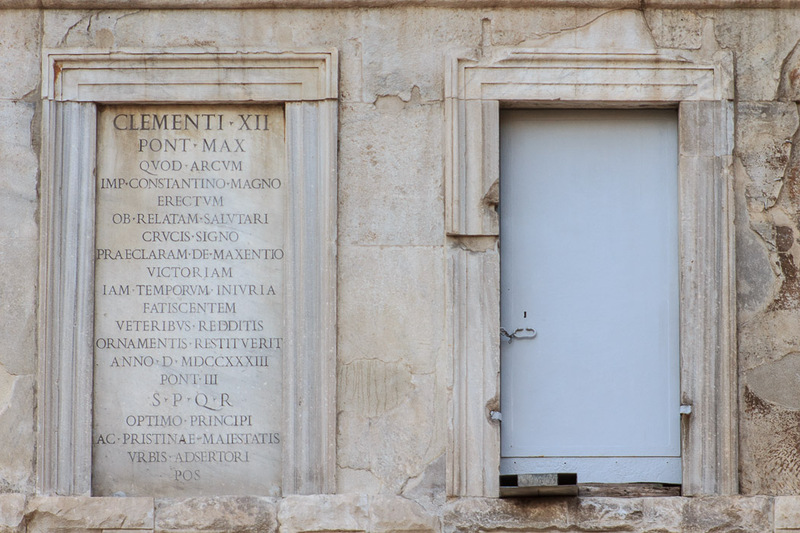 The inside of the central archway has inscriptions that indicate Constantine came not as a conqueror but as one who freed Rome from occupation. They are "Liberator of the City", and "Founder of Peace". 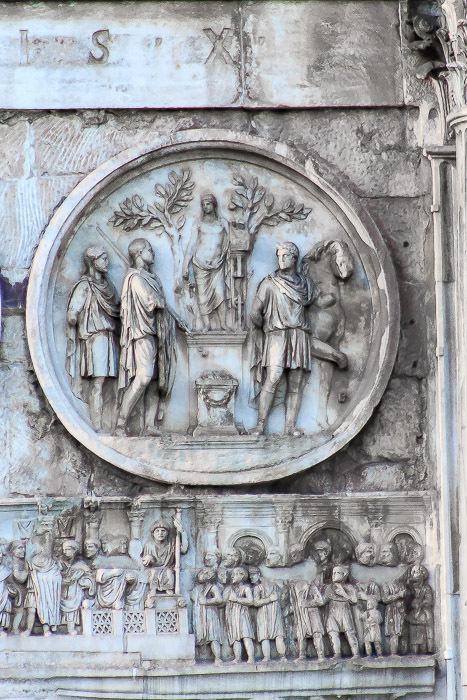 The roundels (also known as tondi, plural of tondo) above the outer arches are from Hadrian's time, also confiscated for reuse in this monument. Some figures in the roundels were modified to resemble Constantine. They are in four sets of two roundels, each set portraying a hunt scene matched with a following sacrificial scene. 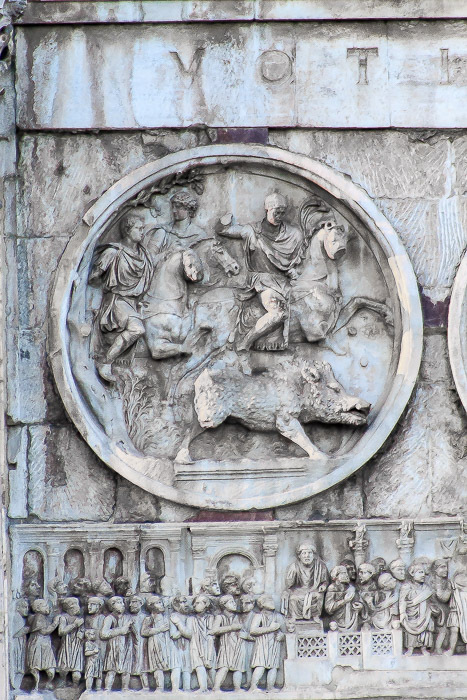 The first roundel on the northern face (1st photo below) shows the emperor, probably the eastern emperor Licinius, hunting a wild boar. The emperor is on a horse about to strike the boar with a now-missing spear. Hadrian's lover Antinous is the top-left figure in the roundel (recall that the emperor faces were originally that of Hadrian). The second roundel on the northern face (2nd photo below) shows a sacrifice to Apollo. Hadrian's head has been recarved as Constantine in this roundel. The third roundel on the northern face (3rd photo below) shows a lion hunt. Constantine's head has a slight halo around it. The third and fourth roundels are the only ones still set in porphyry, an expensive red/purple marble. The fourth roundel on the northern face (4th photo below) shows a sacrifice to Hercules. A small figure of Nike (Victory) appears at Hercules' left side. 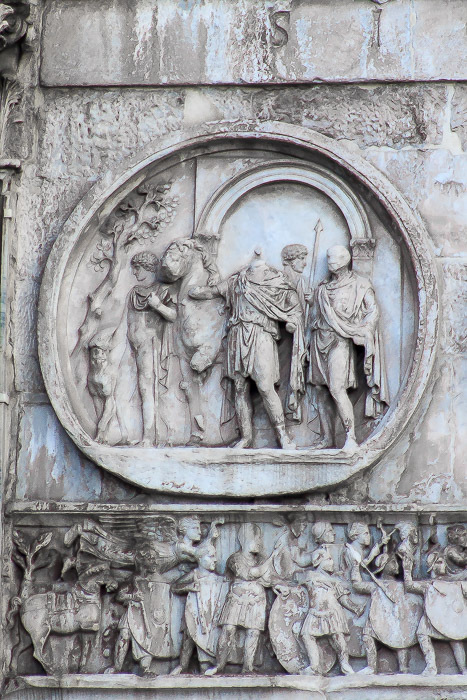 The first roundel on the southern face (1st photo below) depicts a hunting party departing the city. The second roundel on the southern face (2nd photo below) shows a sacrifice to Silvanus, the Roman god of the woods and wild. The third roundel on the southern face (3rd photo below) shows the hunt of a bear. 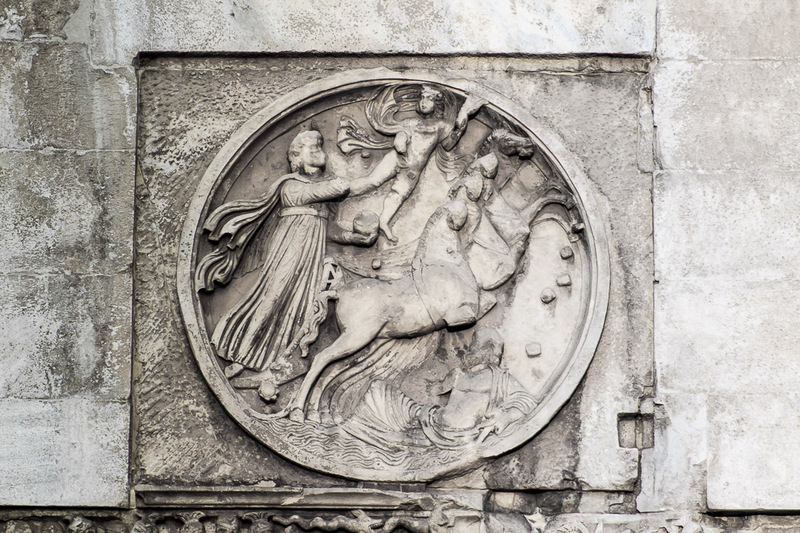 The fourth roundel on the southern face (4th photo below) shows a sacrifice to Diana. 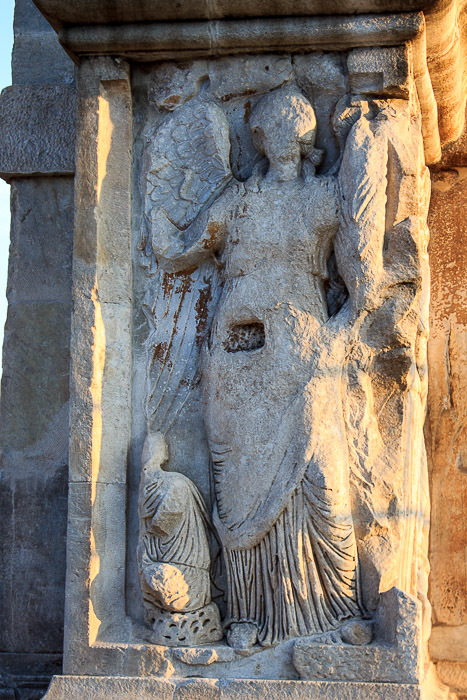 The sacrifices ensure that the gods will render Constantine fortunate and powerful, which compels the viewer to see that the prosperity of the empire rests in the emperor's hands. 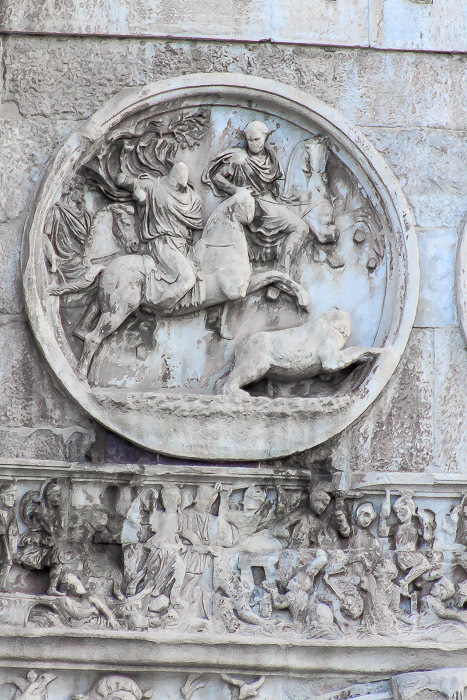 The roundel on the east side (1st photo below) shows Sol / Apollo in his quadriga, a four-horse chariot. 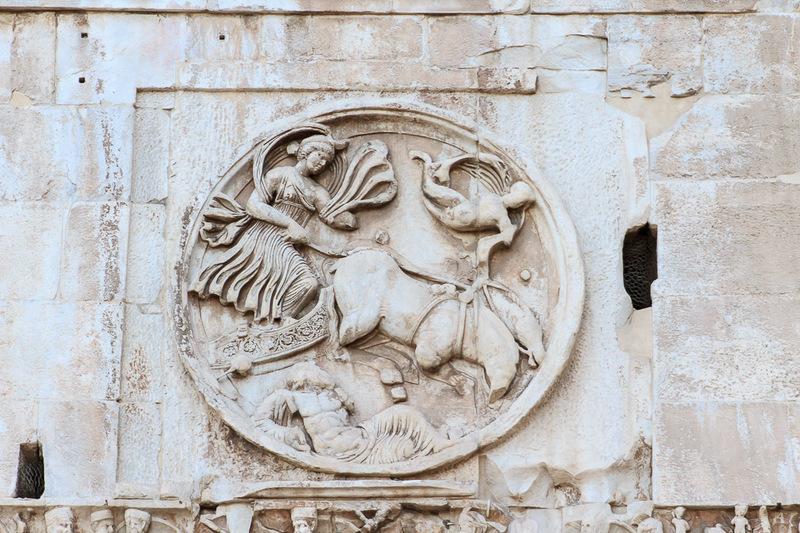 The roundel on the west side (2nd photo below) shows Luna / Diana in her biga, a two-horse chariot. They symbolize the eternal nature of the empire. Both of these roundels were carved during the time of Constantine. 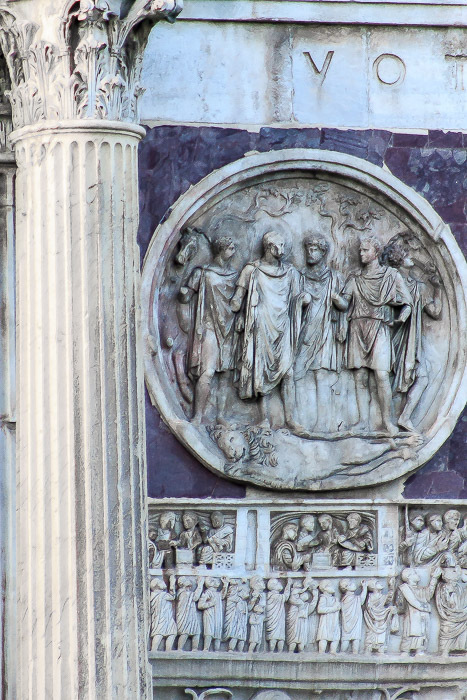 The main piece created from the time of Constantine specifically for this monument is the frieze running around the monument under the roundels, one strip above each outer arch, and on the eastern and western ends of the monument. 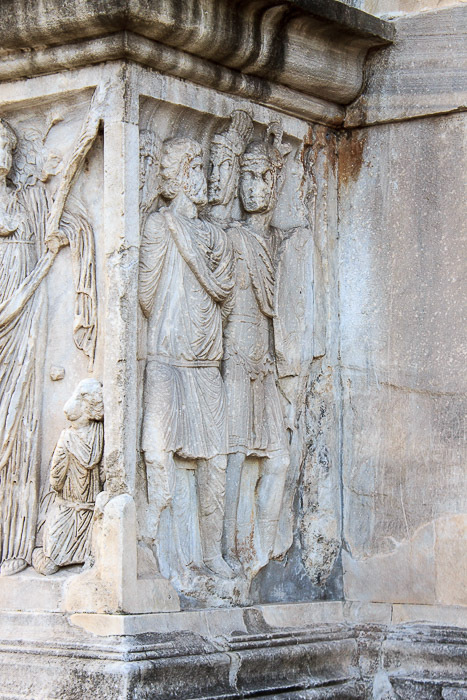 They tell the story of Constantine's rise to power, and they're shown in the 6 photos below. 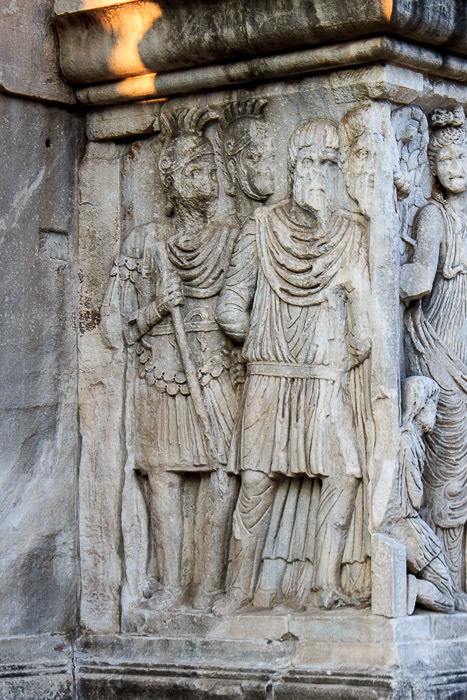 In the spring of 312 AD Constantine and Maxentius were vying for exclusive control of the western Roman Empire. 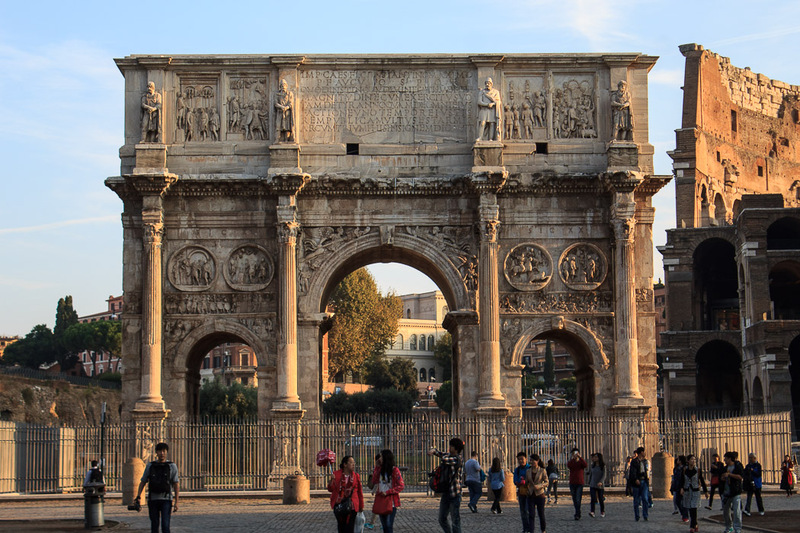 Maxentius (the 'tyrant' mentioned in the arch's inscription) controlled Italy, and Constantine controlled the rest (Britain, Gaul (France) and Spain). 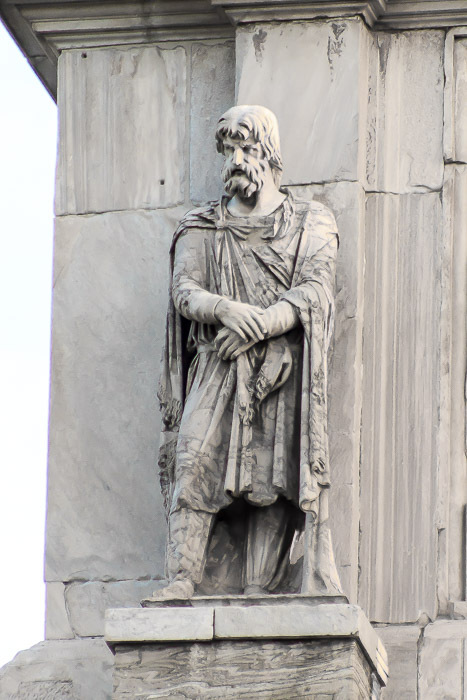 Constantine marched into northern Italy and was welcomed into several major northern cities because the people had become alienated from Maxentius due to high taxation and failure to keep sufficient grain supply flowing from Africa. He rested his troops and consolidated his power for a bit in Milan before pushing further. 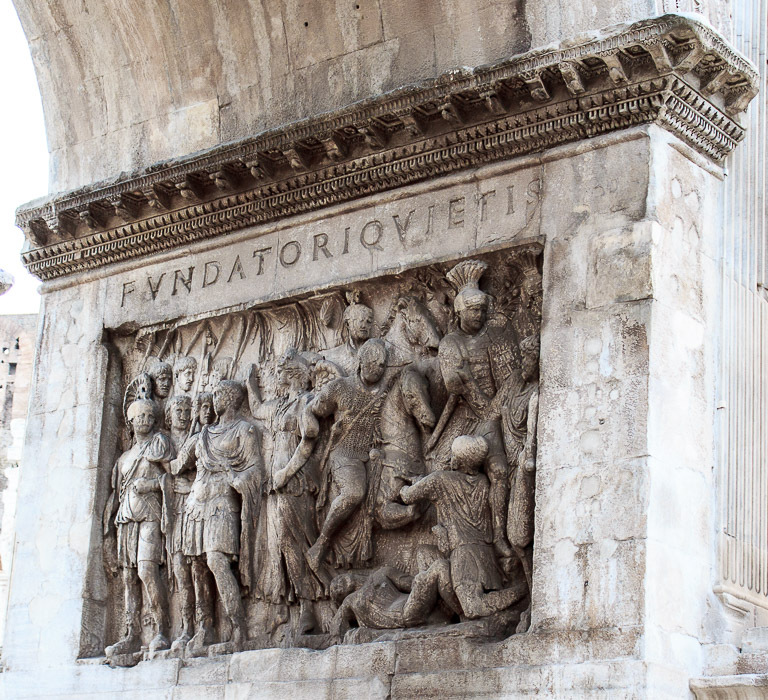 The frieze on the Arch of Constantine takes up the story (1st photo below, from the western edge of the arch) when Constantine departs Milan, riding his chariot, accompanied by soldiers, some with helmets, some with Pannonean caps, some with shields, and animals such as horses and camels. 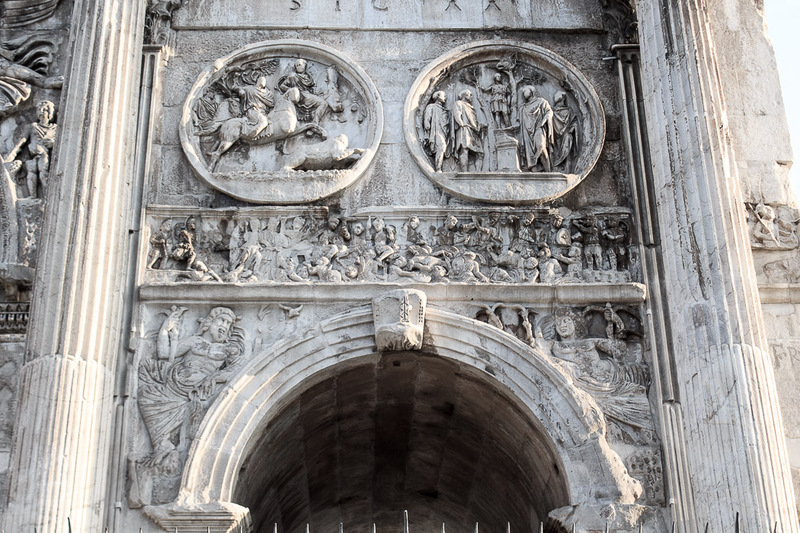 The frieze continues onto the southern side of the arch (2nd photo below, from the left third of the southern side) with the siege of Verona during mid-summer of 312, where Constantine first faced Maxentius' forward army, led by Maxentius' Praetorian Prefect, Ruricius Pompeianus. 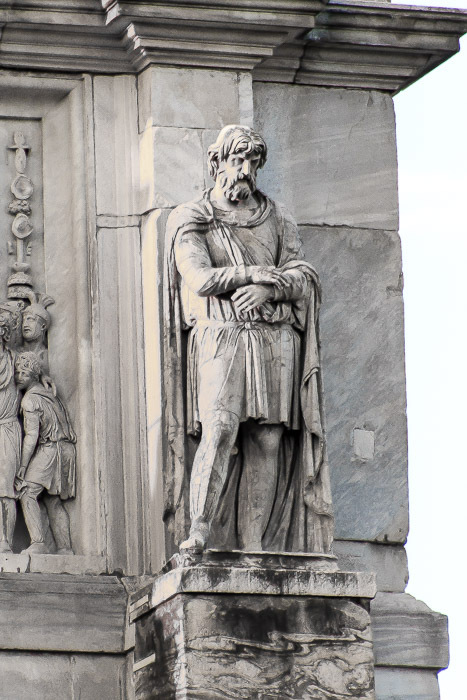 Verona was easily defended since it was bounded on 3 sides by a river, so Constantine could do nothing but surround the city and lay siege to it. This siege is shown in the 2nd photo, in which Constantine is shown twice the size of his soldiers, and is followed by the goddess Victory. Constantine's army is battling right at the city walls. One victim falls from the city wall, and a soldier at the right edge is storming the wall. Constantine's army took the city, and after this battle many cities in northern Italy announced their surrender to Constantine. 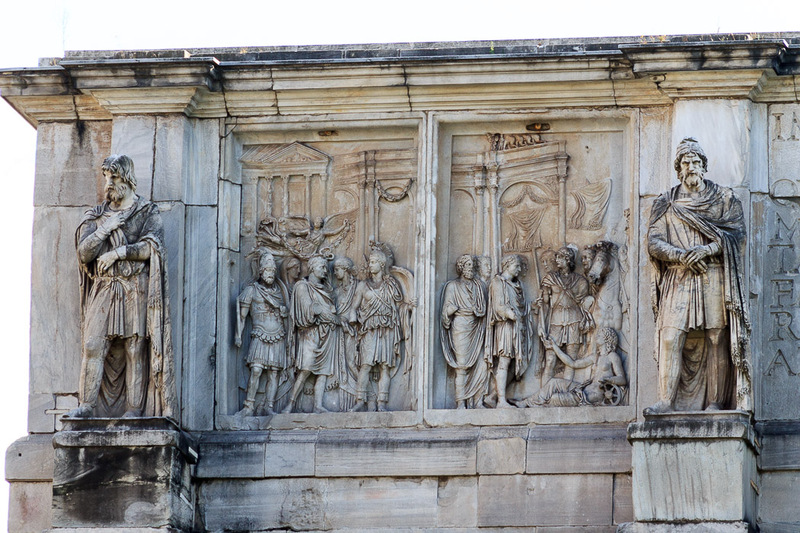 The next scene shows the climactic Battle of the Milvian Bridge (3rd photo below, from the right third of the southern side). Constantine's army is victorious and the enemy is drowning in the Tiber River. Even Maxentius himself drowned during this battle. 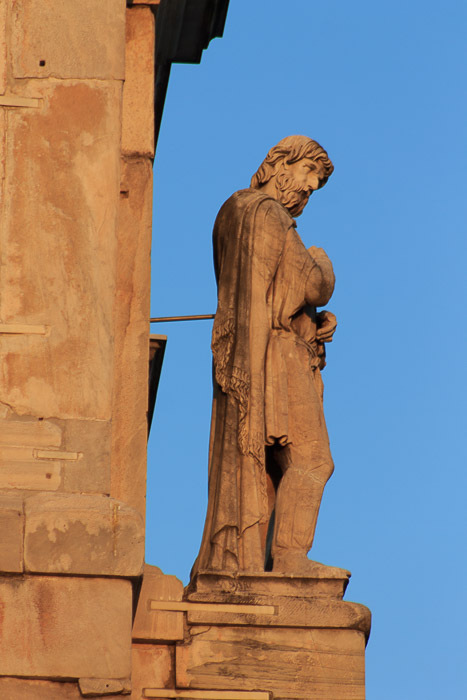 Constantine had Maxentius' body dragged out of the Tiber, beheaded, and put the head on display in Rome as a warning to anyone who would oppose Constantine. Of interest to me in the 2nd and 3rd friezes is that I don't find any chi-rho painted on any shield, suggesting to me that this was a later embellishment to the story. 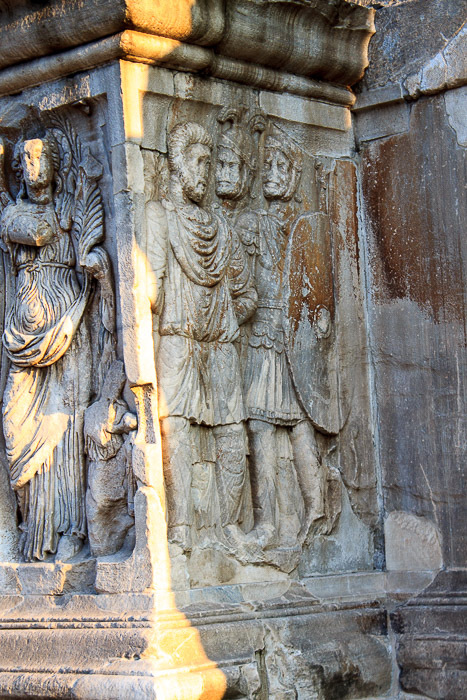 Next, Constantine and his army returns to Rome triumphantly (1st photo below, from the eastern side of the arch). The artist seems to have avoided using imagery of the triumph, as Constantine probably did not want to be shown triumphant over the Eternal City. However Constantine still rides a four-horse quadriga in the parade. On the northern face, looking "towards" the city, are two strips with the emperor's actions after taking possession of Rome. 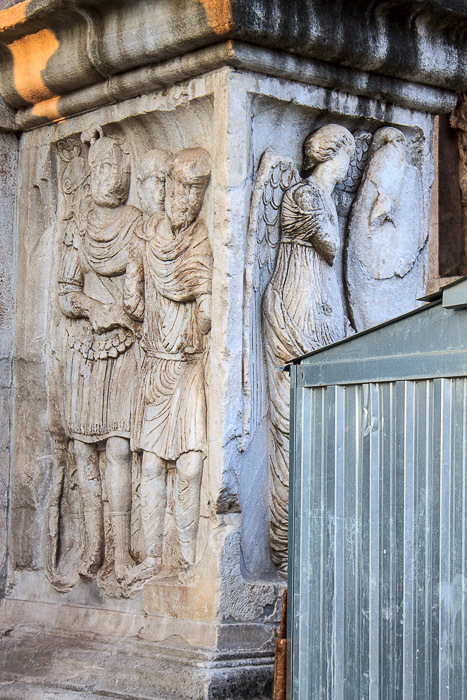 The first shows Constantine speaking to the citizens in the Roman Forum from the Rostra (2nd photo below, from the left third of the northern face). Constantine is in the center, but his head is unrecognizable. 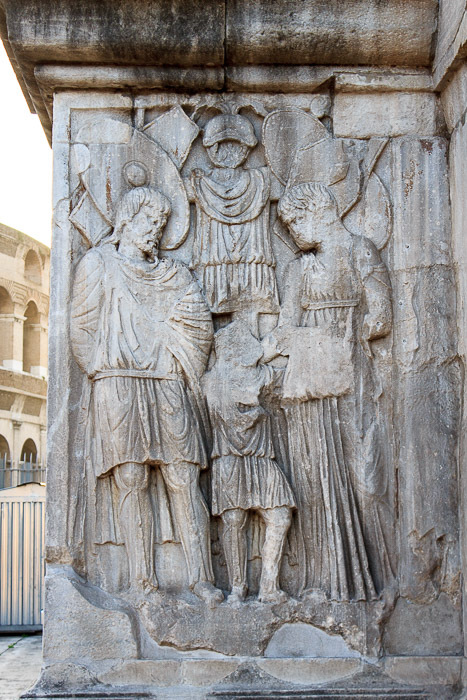 Several details of this frieze are of interest: The Rostra of the time is shown nicely, with the five honorary columns of Diocletian's Decennalia behind it. 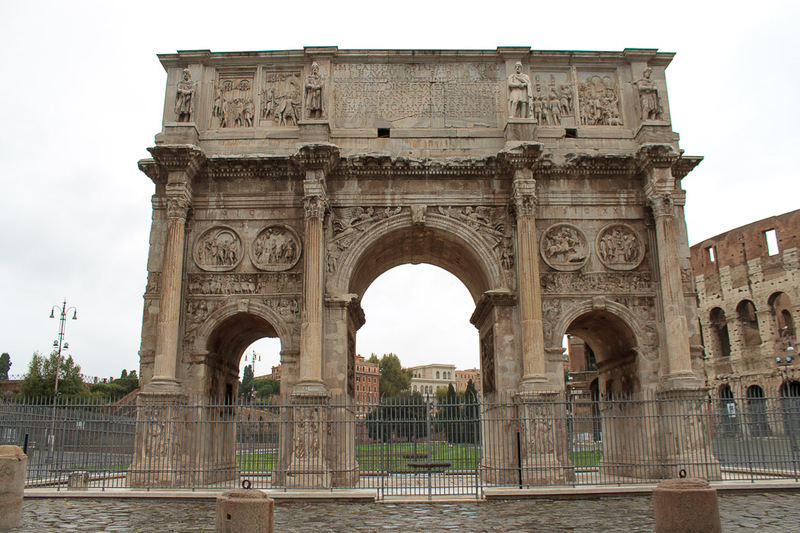 The Basilica Julia is shown in the background on the left, and the Arch of Septimius Severus is shown in the background on the right. 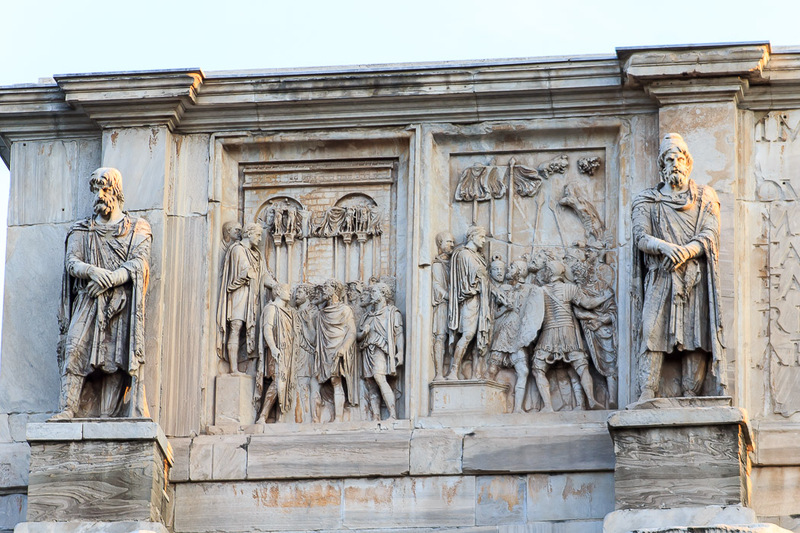 The two statues at the ends of the Rostra are of Marcus Aurelius, on the left as we face the frieze, seated and wearing a toga, and Hadrian, on the right, with his beard, holding a globe in his right hand. They are shown for propaganda purposes, linking Constantine to two great emperors of the past. 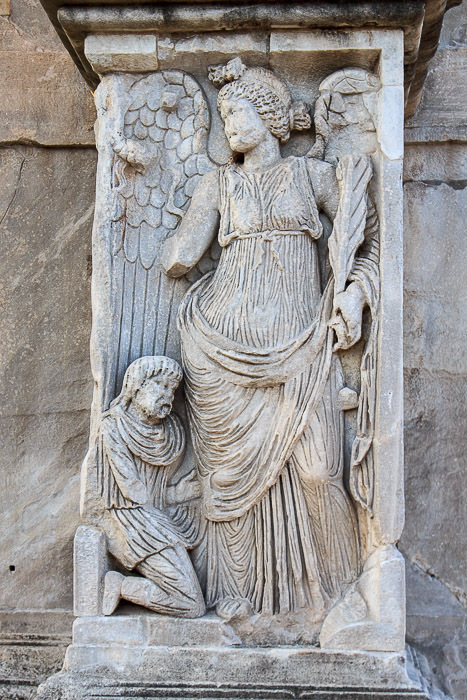 The second strip shows Constantine distributing money to the people (3rd photo below, from the right third of the northern face), similar to Marcus Aurelius in the liberalitas attic panel, and to Trajan's charity to the poor children on the Plutei of Trajan. Constantine is again in the center, his head is missing. Four small rectangular scenes at the top-left and top-right corners of the panel show the distribution of money and the associated record-keeping. 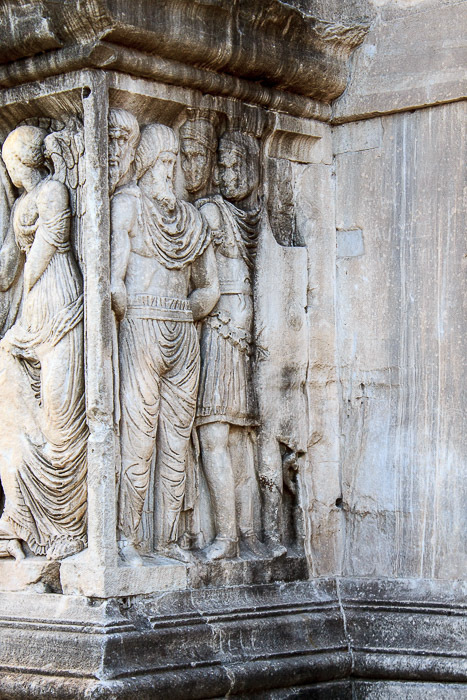 The final two scenes are of particular importance because they place Constantine in the middle of the people, with each of the Romans facing towards him in an orderly fashion. This layout has a direct relationship to the layout of The Last Supper. 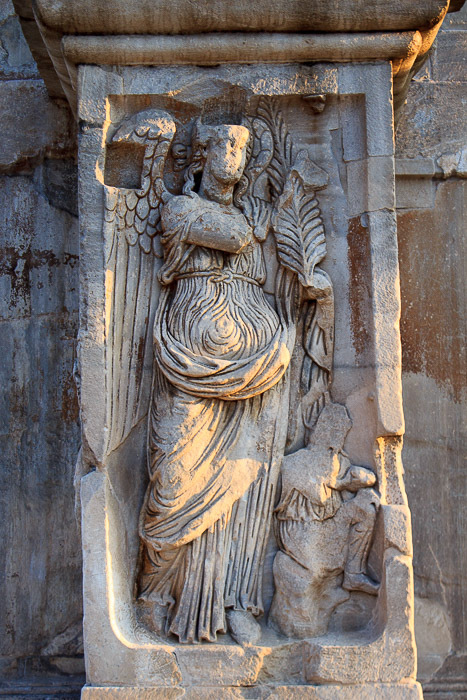 Constantine has subliminally represented to the Roman people that he will be the one to lead the empire to a new age of prosperity, not through tyranny and oppression, but through kindness and compassion. 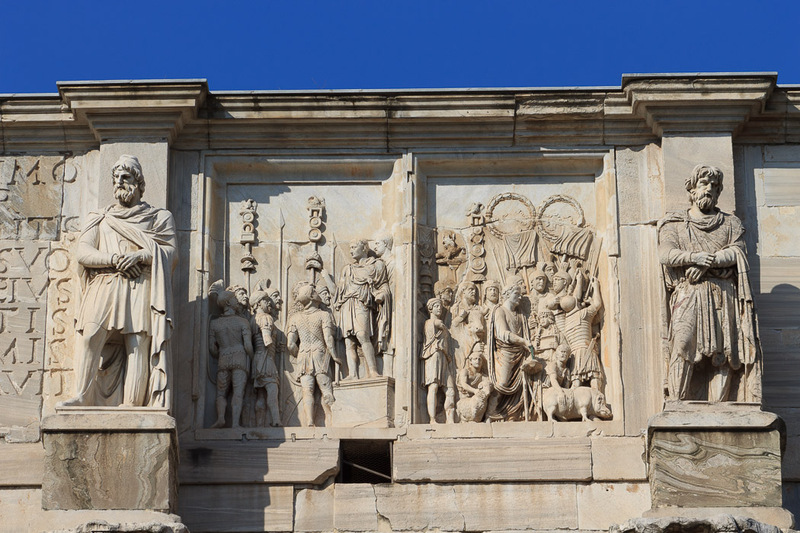 The contrast between the styles of the re-used imperial reliefs of Trajan, Hadrian and Marcus Aurelius and those newly made for the arch is dramatic, although in the case where the head of an earlier emperor was replaced by that of Constantine the artist was still able to achieve a high artistic quality. Specifically, compare the re-used roundel of Hadrian sacrifice to Apollo (1st photo below), where natural poses and a feeling of open airy space in which the figures move freely is conveyed, and the re-used (adventus) Marcus Aurelius relief (2nd photo below) with the frieze newly-created for the arch (3rd photo below) where the figures are pressed flat and trapped between two imaginary planes and lack any freedom of movement in any direction, with gestures that are unnatural, heads out of proportion, and inferior surface texture. 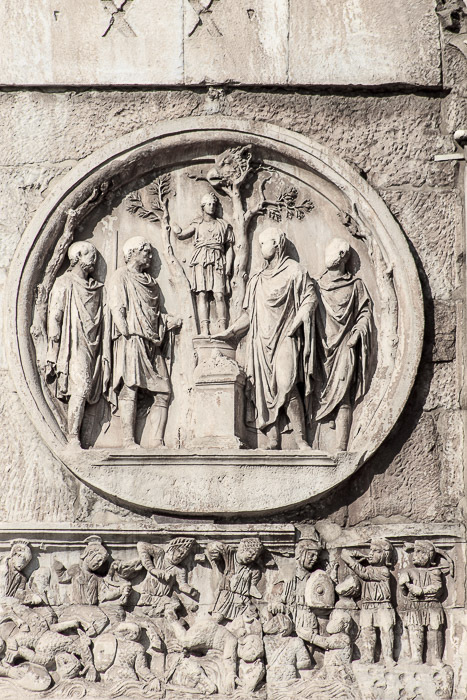 Similarly, the two roundels carved at the time of Constantine, those on the ends of the monument, don't show nearly the three-dimensionality of the roundels on the two faces of the monument from the time of Hadrian. 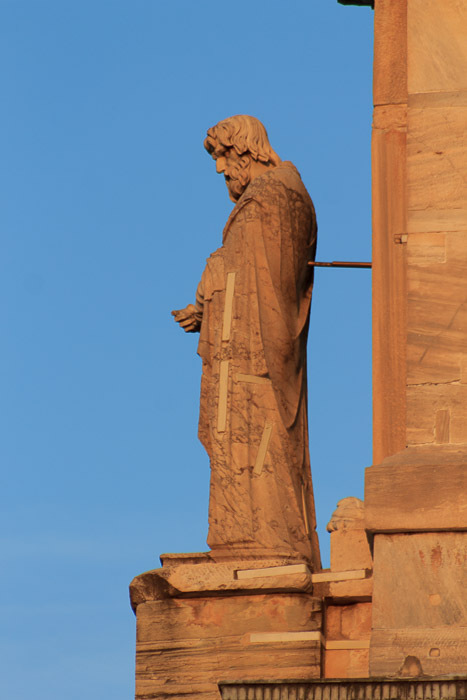 Presumably the monument was important enough that the best available craftsmen in Rome at the time were used. It is unknown why the artistic quality was so much poorer than two centuries before. Some people say this is symbolic of the decline of the Roman Empire. Some people say it was an intentional change toward presenting the world in a simpler way. Maybe it was something as familiar to us as an unrealistic deadline for completion of the monument that precluded quality work. 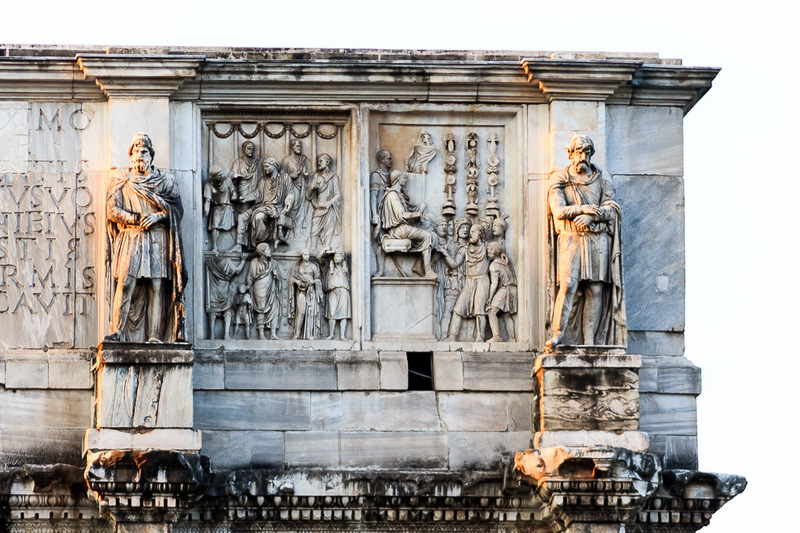 Four quite large reliefs on the Arch of Constantine probably came from a 30-meter-long frieze in Trajan's Forum, dubbed the Great Trajanic Frieze, which originally depicted Trajan and were created early during his successor Hadrian's reign. They are located on the attic on the sides of the arch, on the walls of the central arch. The frieze on the attic of the western end (1st photo below) shows an ambush by Roman soldiers against their Dacian enemies during the wars from 101 to 102 AD and 105 to 106 AD. The Roman soldiers have superior weaponry and equipment, and trample fallen Dacians while attacking several more. The frieze on the attic of the eastern end again shows the Romans victorious in battle against trampled or falling Dacians. 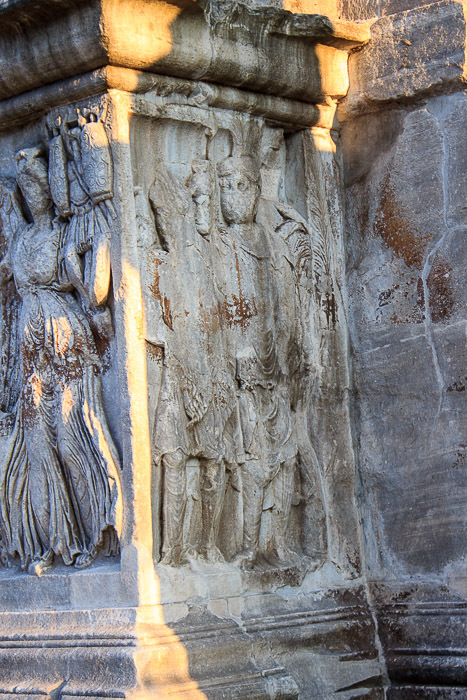 The frieze on the west wall of the central arch (1st and 2nd photos below, taken from the south and north, respectively) shows Trajan on horseback, with his cape billowing in the wind, above a fallen Dacian soldier who cowers below. Another Dacian soldier faces the emperor, on his knees, begging for mercy. 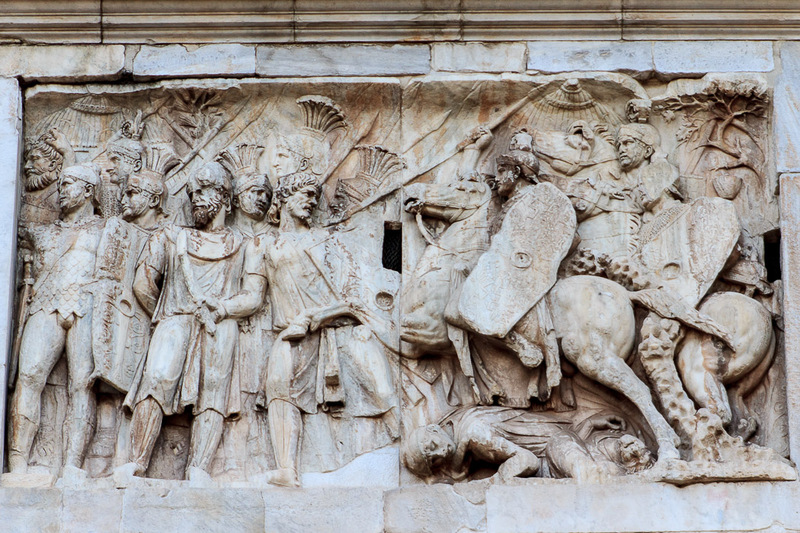 Trajan himself wears no helmet, so his participation in the battle is certainly symbolic. 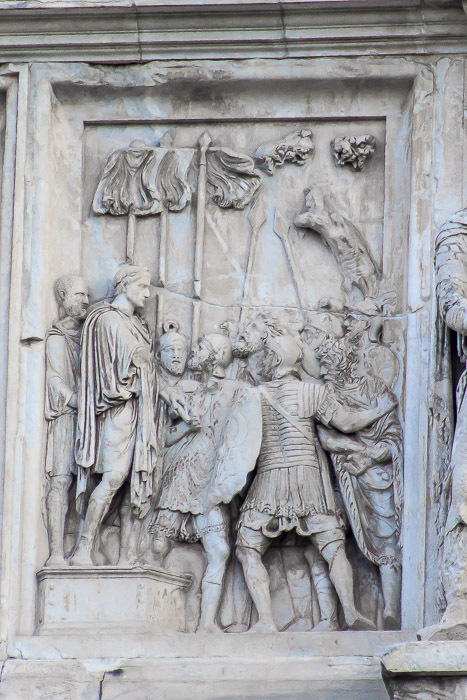 An armored Roman soldier on Trajan's left (our right) is on the verge of beating the Dacian who cowers away from him. 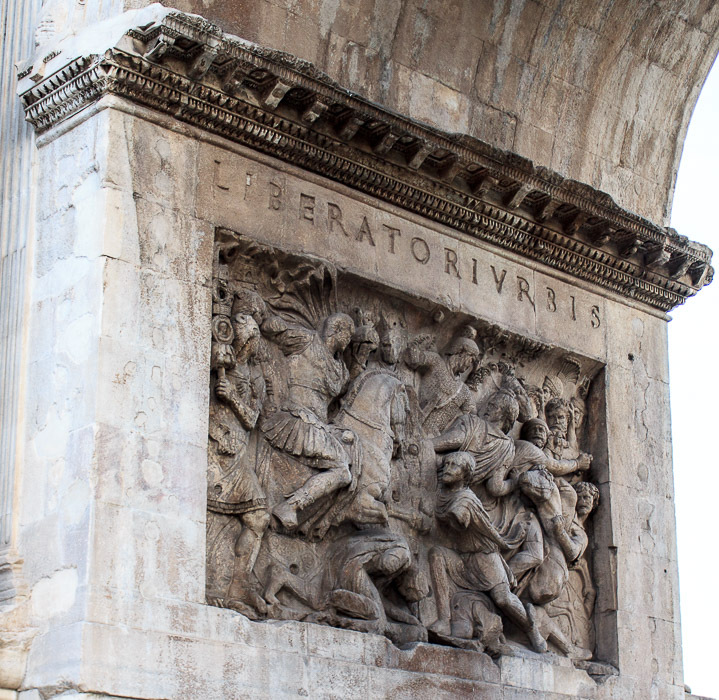 The inscription above the scene reads Liberatori Urbis (Liberator of the City). 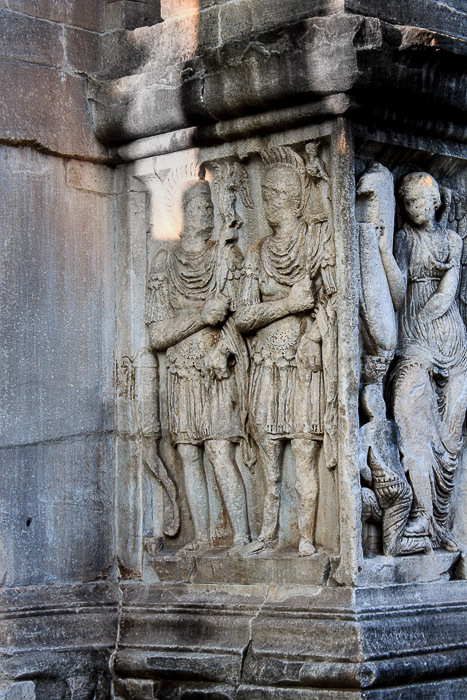 The frieze on the east wall of the central arch (3rd and 4th photos below, taken from the south and north, respectively) shows two scenes combined into one. 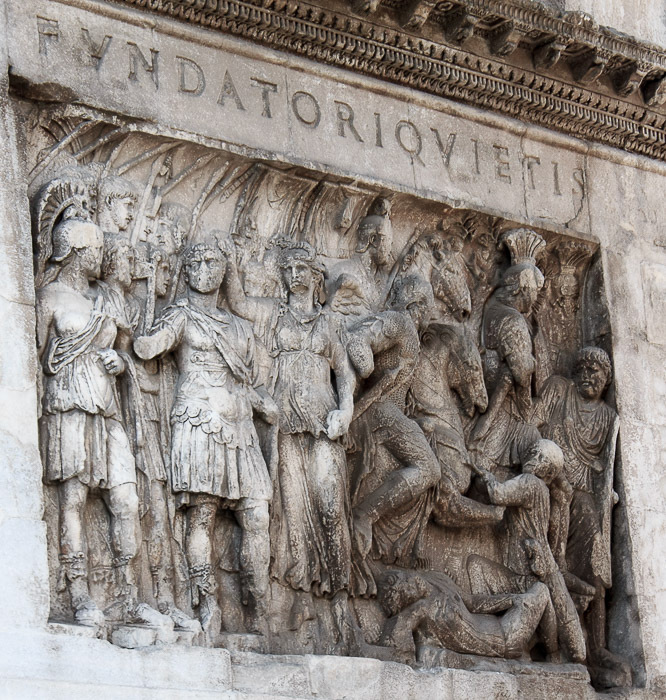 The left half shows Trajan standing between Roma and Victory, who is about to place a wreath on his head. 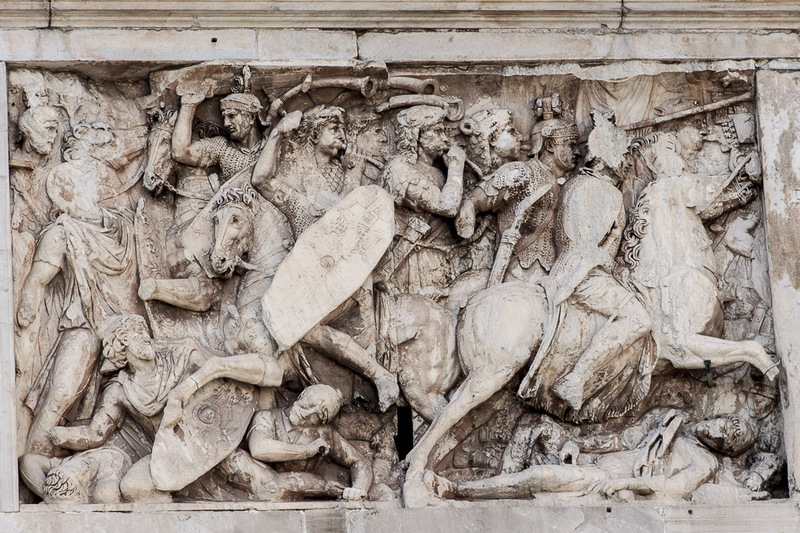 To the right of Victory, Roman soldiers on horseback trample and defeat Dacians in a scene reminiscent of the friezes in the attic of the east and west side of the arch. 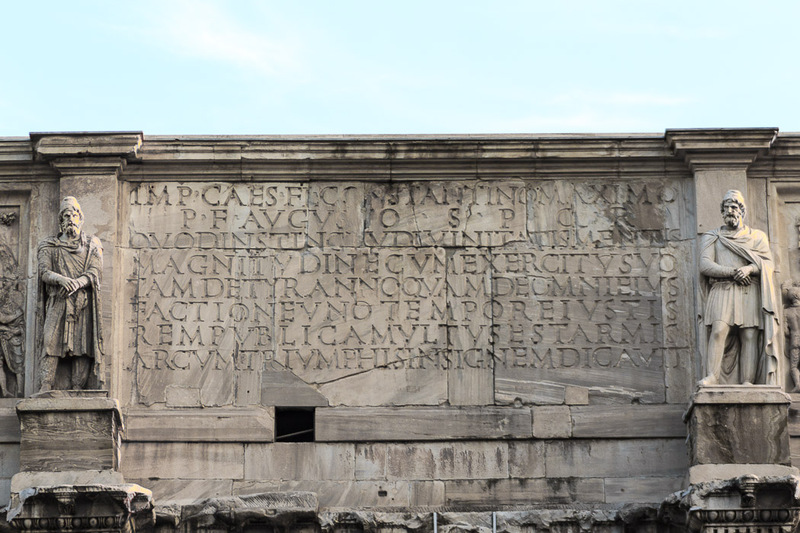 The inscription Fundatori quietis (Founder of Peace) appears above the relief. Put these all together, in order of the 6th photo, then the 2nd photo, then the 4th photo, then the 1st photo, and you can imagine the Great Trajanic Frieze in its original 30-meter-long glory, as originally displayed in Trajan's Forum and now on display (in a plaster cast, 1st photo below) in the Museum of Roman Civilization. See all Museum of Roman Civilization photos. The inclusion of scenes which would have been familiar to Romans from Marcus Aurelius, Hadrian and Trajan was a tour de force of political propaganda, presenting Constantine as a living continuation of the most successful Roman Emperors from the past. 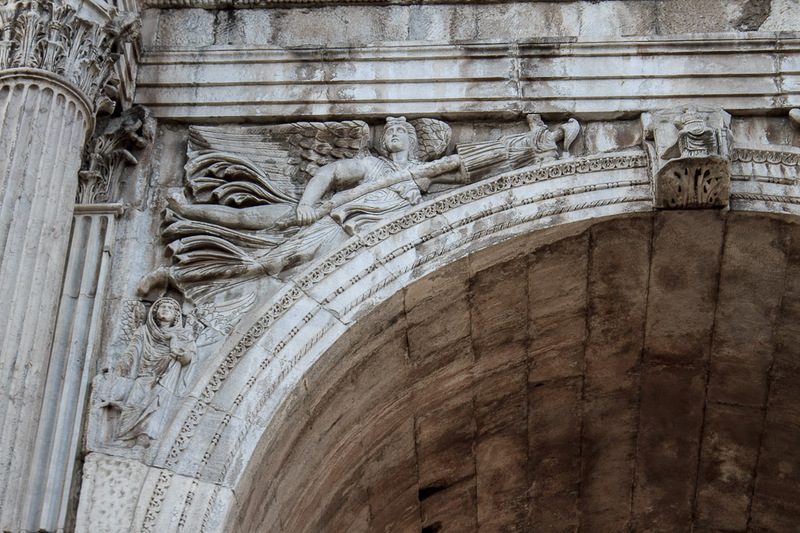 The Victories in the spandrels of the central arch and the river gods over the side arches are also original artwork from Constantine's time. 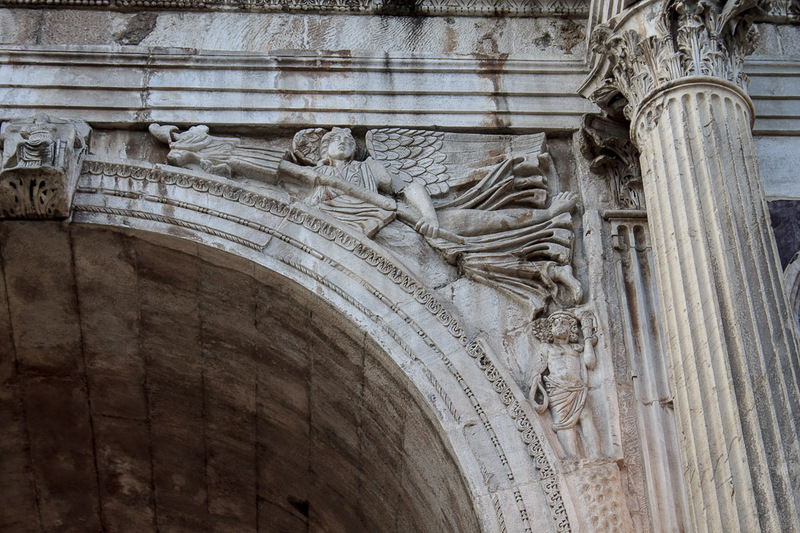 They were carved into the arch after it had been erected. The Victories, shown in the four photos below, each stand above a genius (a guiding spirit of) one of the four seasons, and they each hold trophies. I believe the Victory in the four photos stand above winter, spring, summer and fall, respectively. The keystone on the northern face (1st two photos below) shows the emperor, seated. The keystone on the southern face (last two photos below) is badly damaged and unrecognizable. The spandrels over the side arches in the four photos below display various views of river deities. 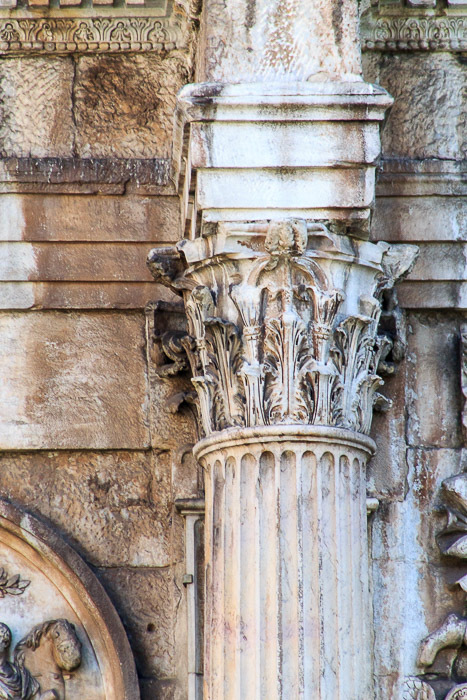 These shots also show the relationship between the side arches, the Frieze of Constantine, and the Hadrian Roundels. They also show 4 more inscriptions which mean, respectively, "Solemn vows for the 10th anniversary", "many happy returns", "as for the 10th", "so for the 20th anniversary". Constantine became emperor in 306, he celebrated his 10th year as emperor in 315, when the arch was inaugurated during his stay in the city. The eight columns each stand on a socle, a block of stone a few feet tall. The socles are sculpted with themes including captives being lead by Roman soldiers and Victories near captive enemy soldiers. There are eight columns, and each socle has 3 sides, the 4th (back) side being attached to the monument. I like the first two photos below because they give an unobstructed view of the north face and one of the sides of the Arch of Constantine from distant vantage points that provide an unobstructed view. 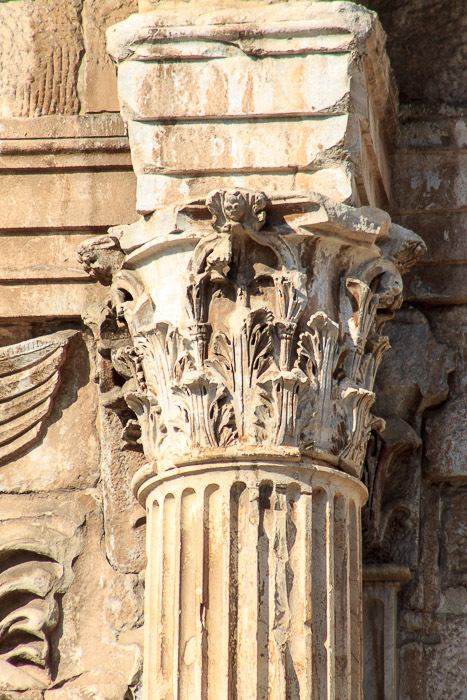 The 3rd and 4th photos show a couple of the Corinthian capitals at the top of the columns. The 5th photo below shows the inscription and doorway I like the last 3 photos because they show the Arch of Constantine during the morning golden hour, not too long after sunrise. 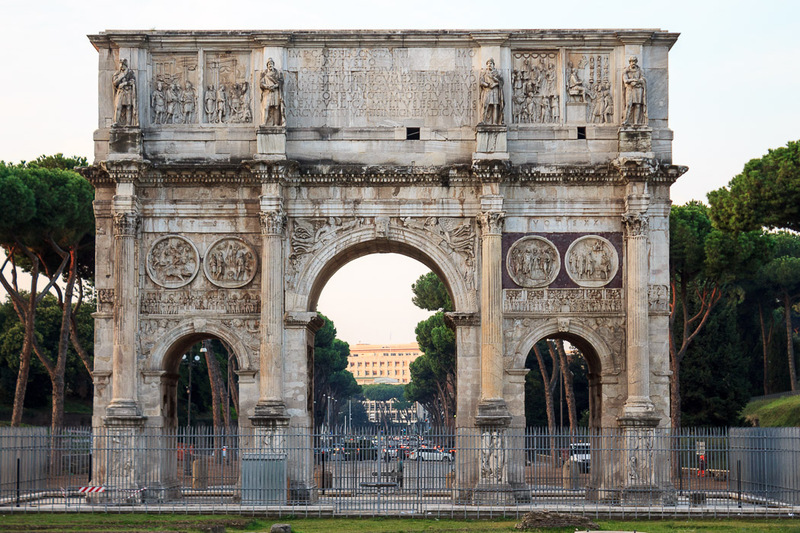 During the Middle Ages, the Arch of Constantine was incorporated into the Frangipane family stronghold of ancient Rome. Works of restoration were first carried out in the 18th century; the last excavations have taken place in the late 1990s, just before the Great Jubilee of 2000. The arch served as the finish line for the marathon athletic event for the 1960 Summer Olympics.